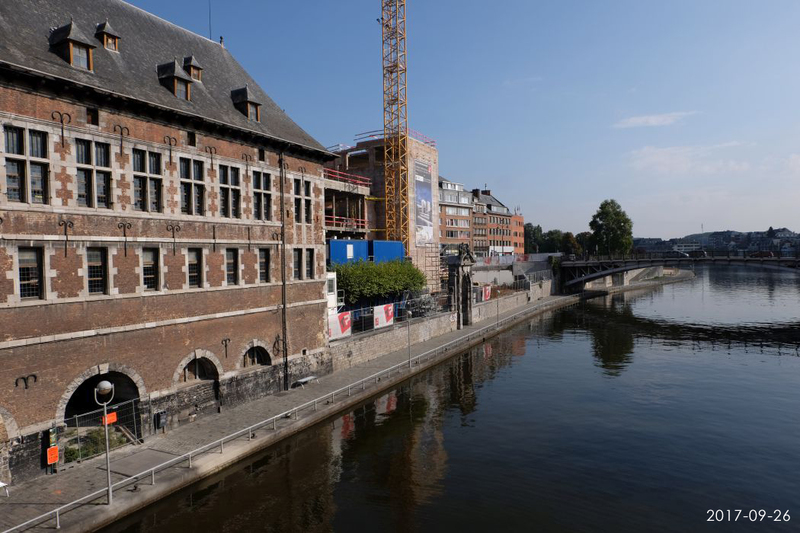 This cultural centre sits in the centre of Namur, on the north bank of the Sambre River, facing the historic centre of the town known as “Le Grognon”. 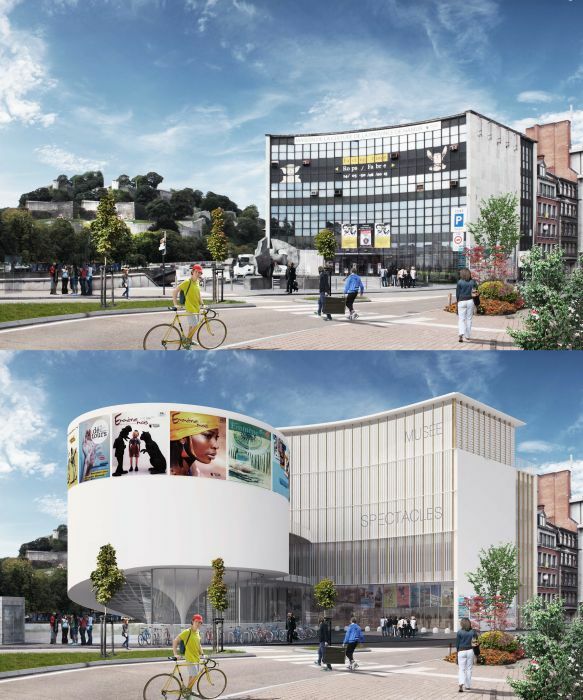 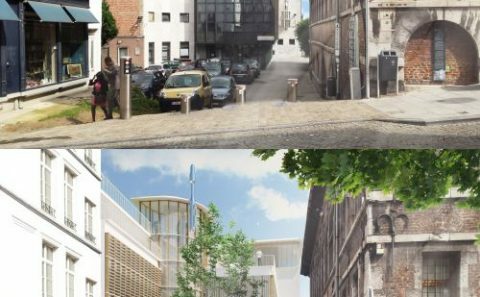 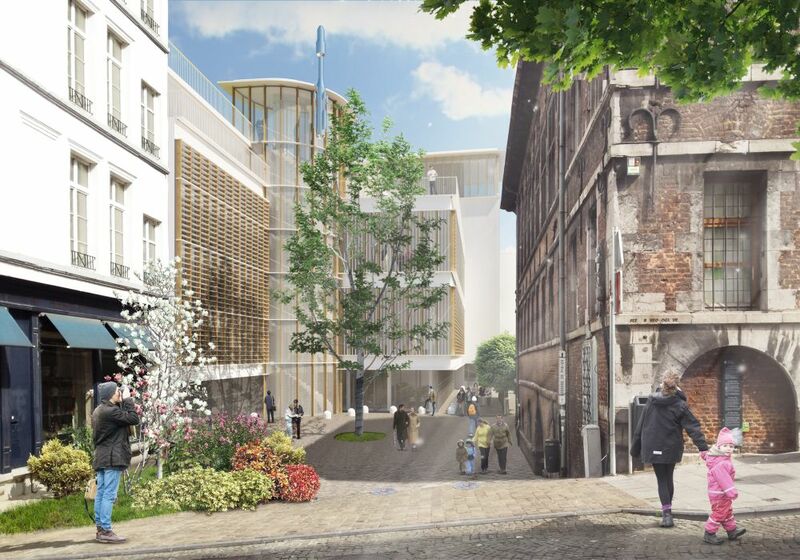 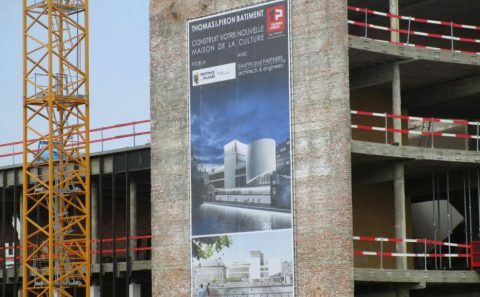 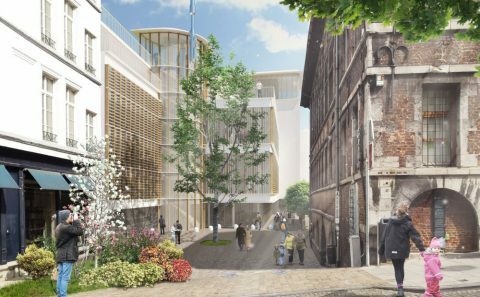 Designed by Victor Bourgeois and built at the start of the 1960s, the building requires renovation and extension to meet the current requirements of local people and to accommodate the redevelopment of the rue des Bouchers along the banks of the Sambre River. 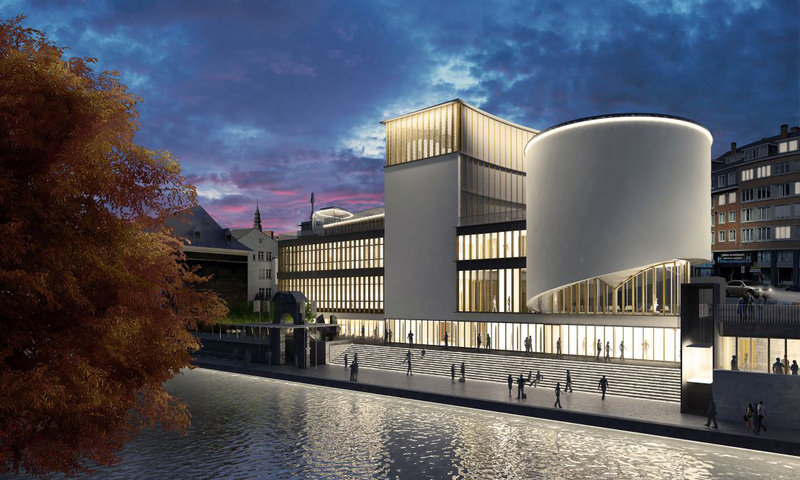 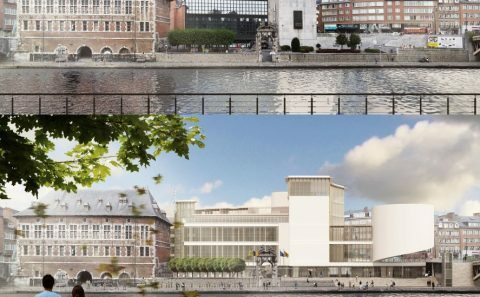 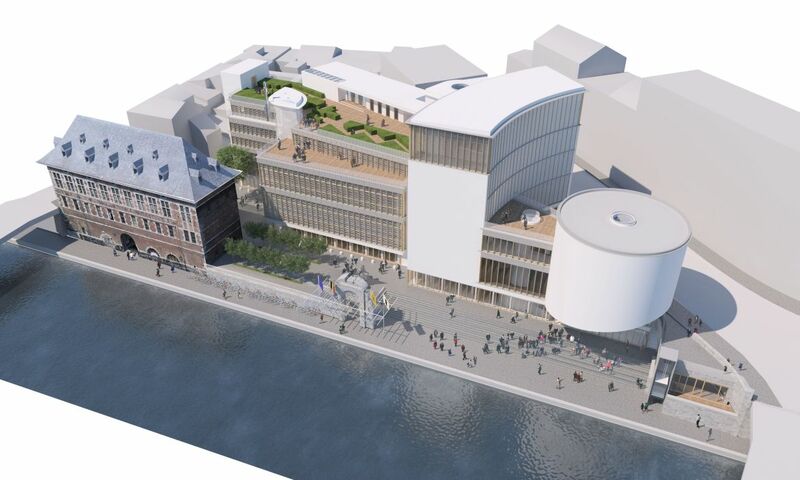 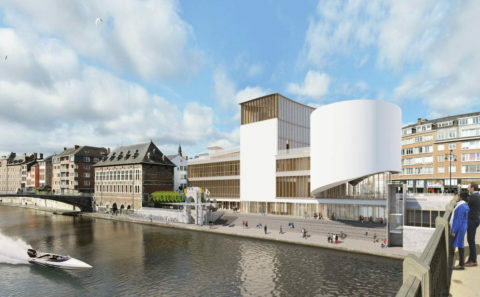 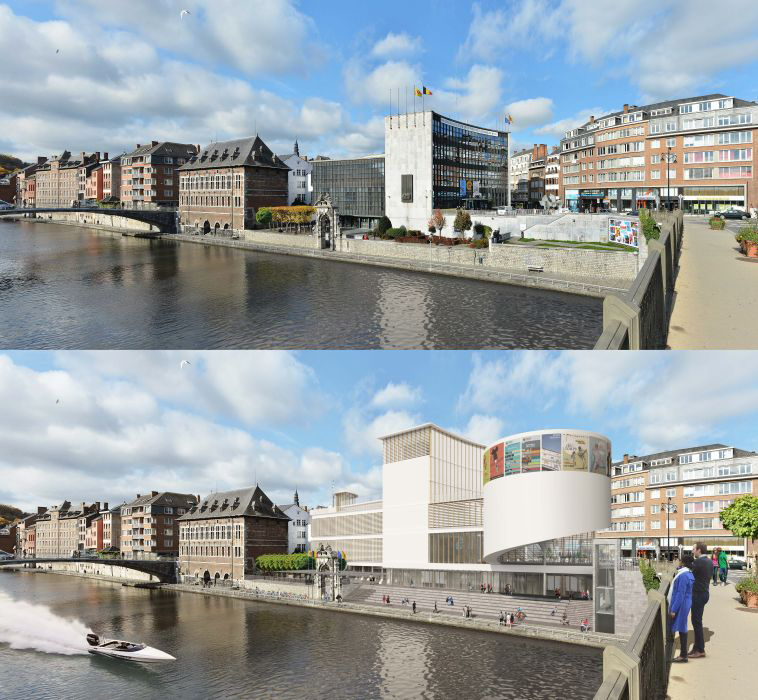 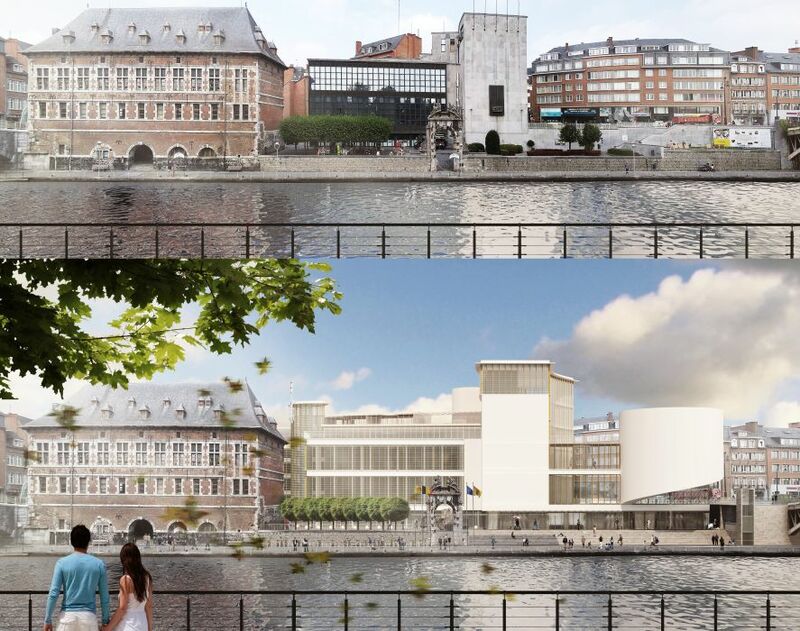 The building currently consists of a 400-seater theatre at one end of a rectangular box-shaped space on four levels (I, II, IV, VI) with a south-facing curtain wall (looking over the Sambre River) built up against a curved rectangular box-shaped space on five levels (I, II, IV, VI, VII), known as the “croissant”, which has an east-facing curtain wall and a south-facing end wall which has no openings. 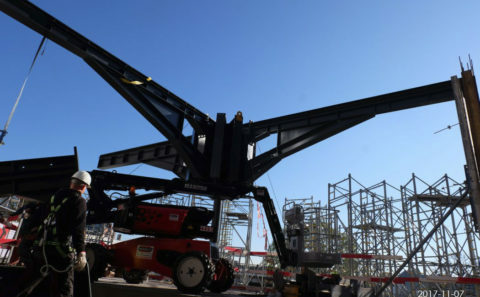 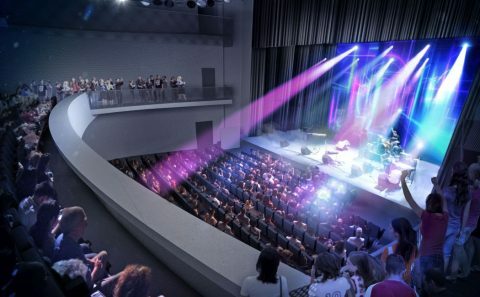 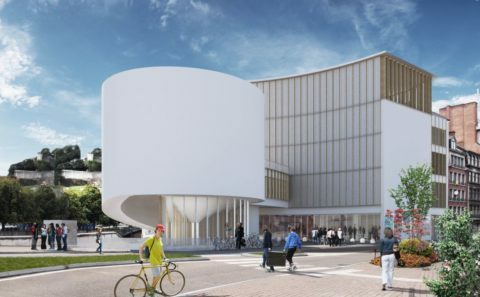 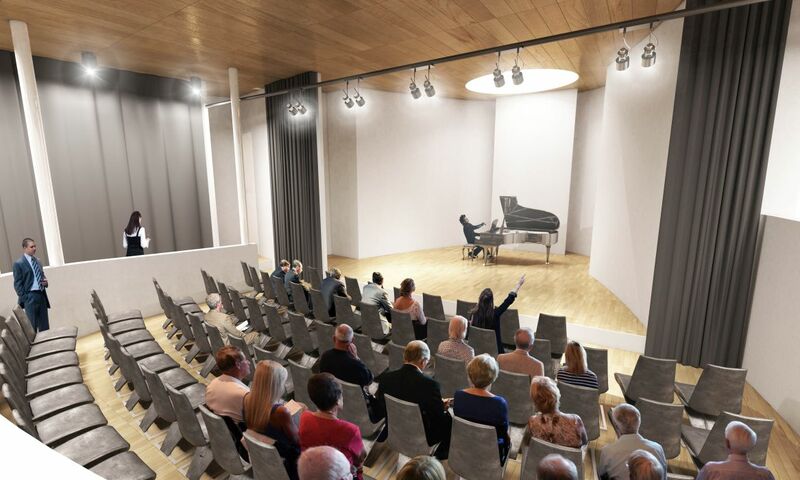 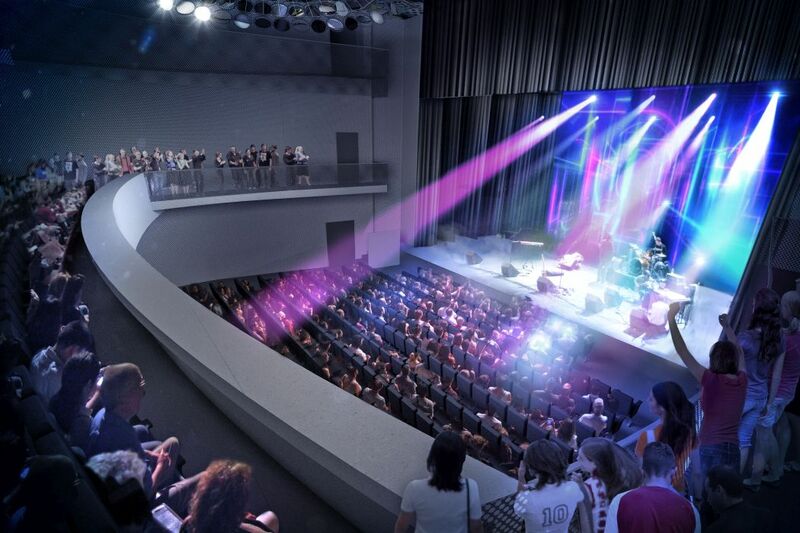 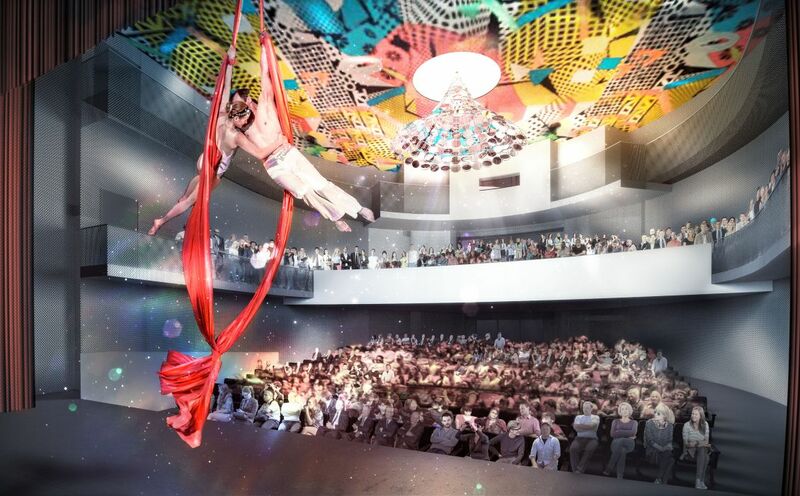 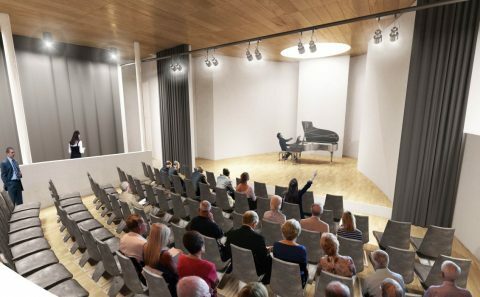 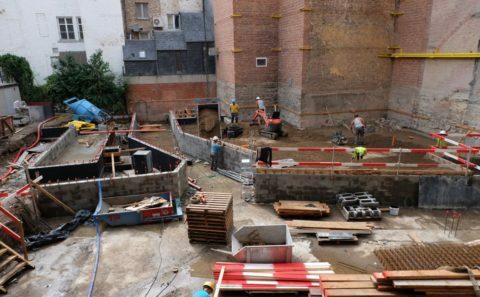 The project shall preserve the existing construction (with the exception of the small buildings annexed to the backstage area and at the site’s north-west corner). 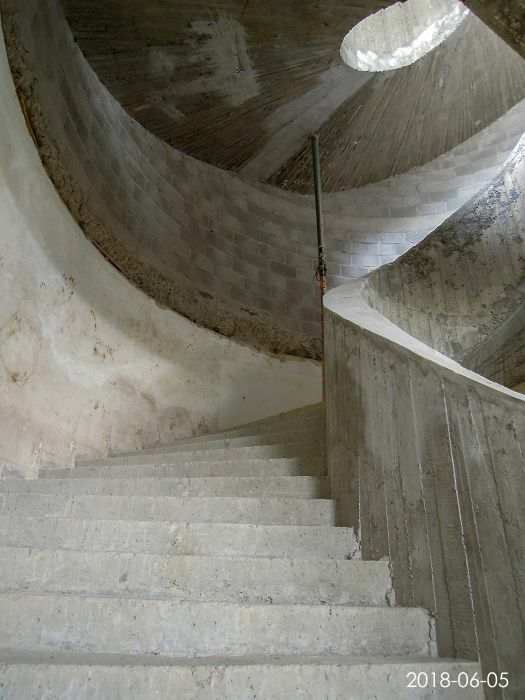 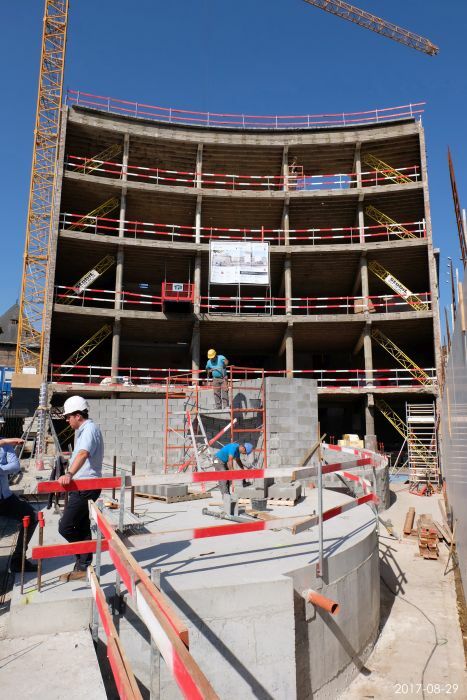 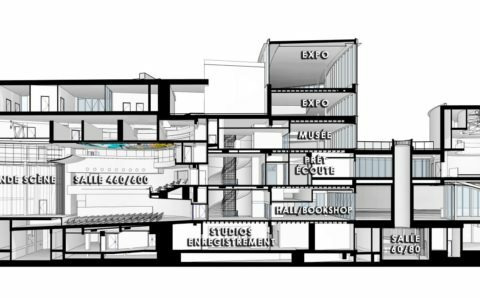 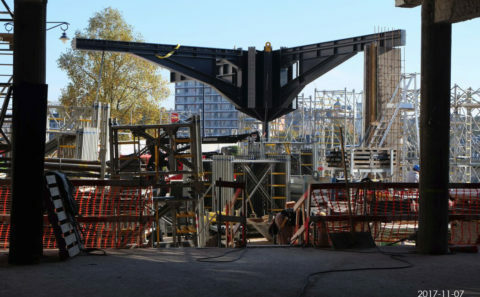 Two intermediate mezzanines shall be added (levels III and V) as well as an additional level on top of the “croissant” (level VIII), with extensions to accommodate the functionality required. 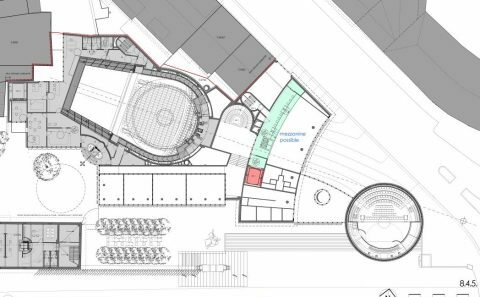 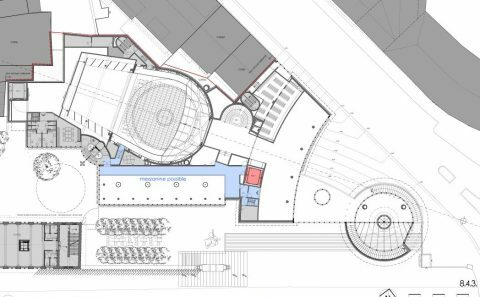 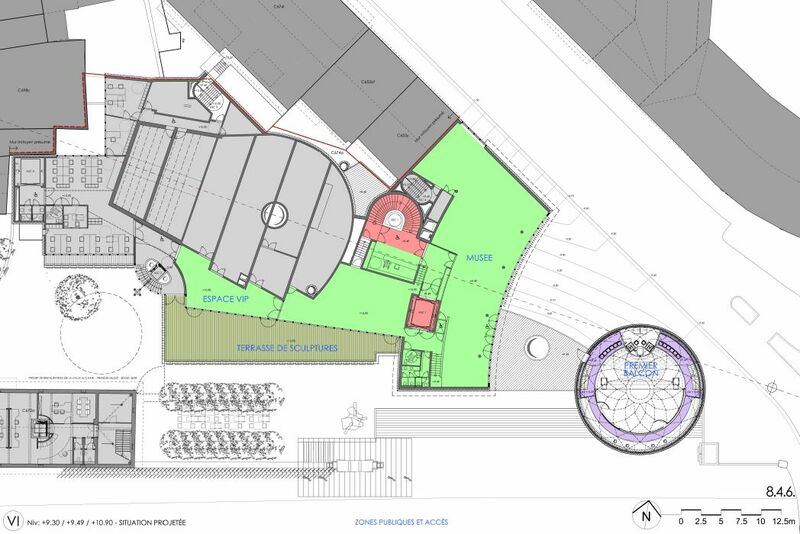 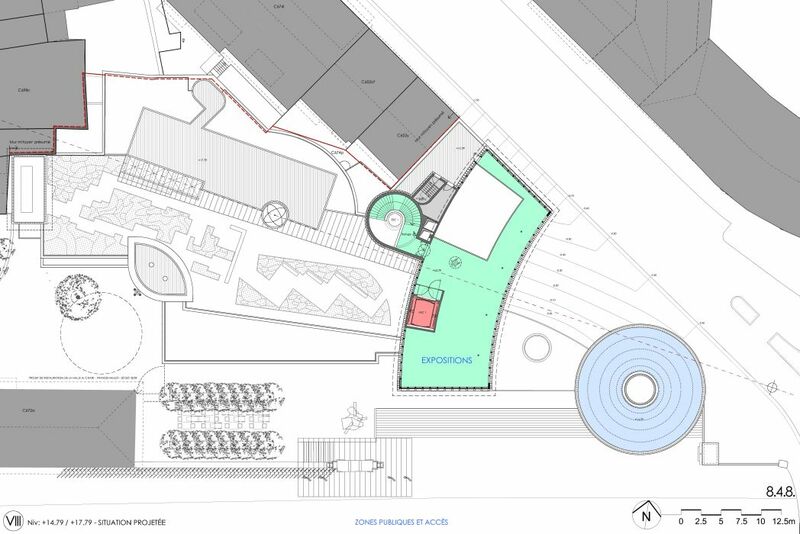 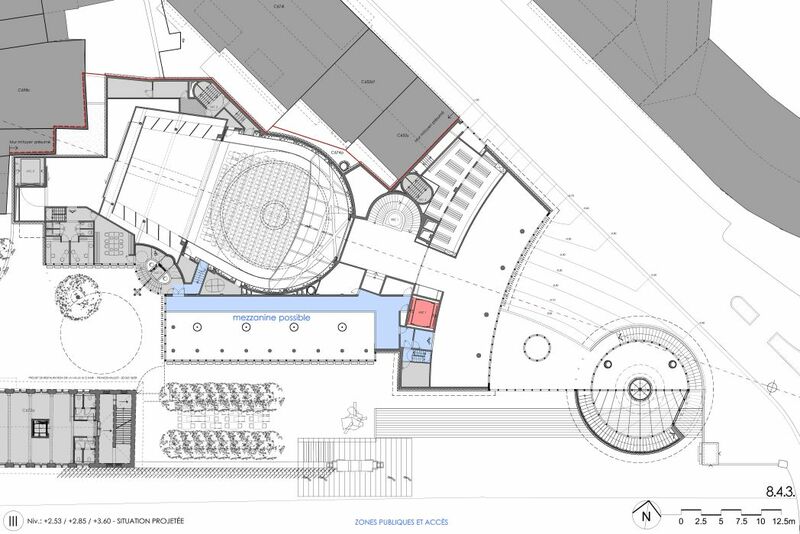 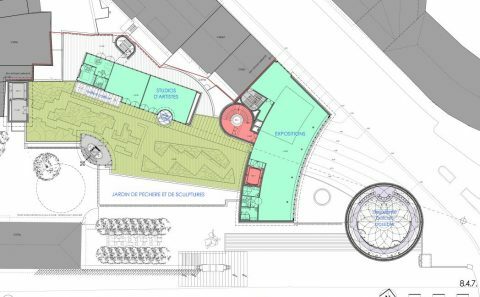 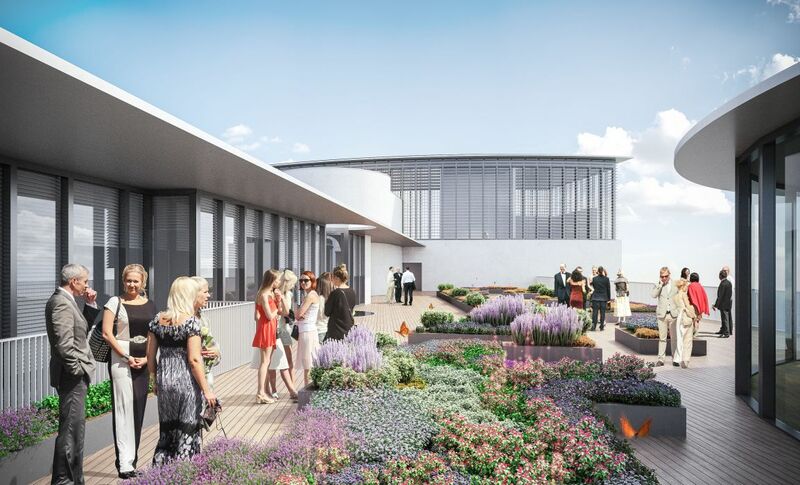 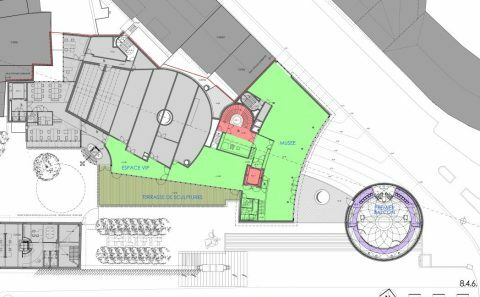 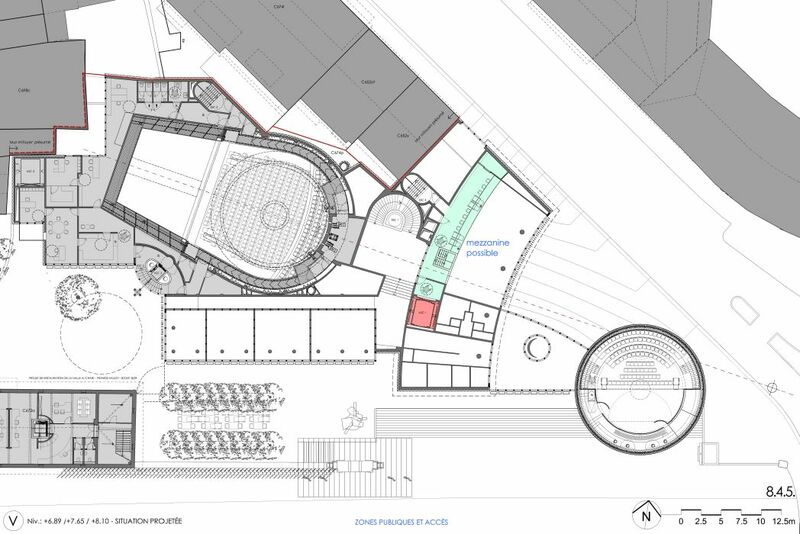 These additions shall include, to the east of the building in front of the “croissant”, the “prow cylinder” comprising the reception porch, and significant extensions to the north-east of the building. 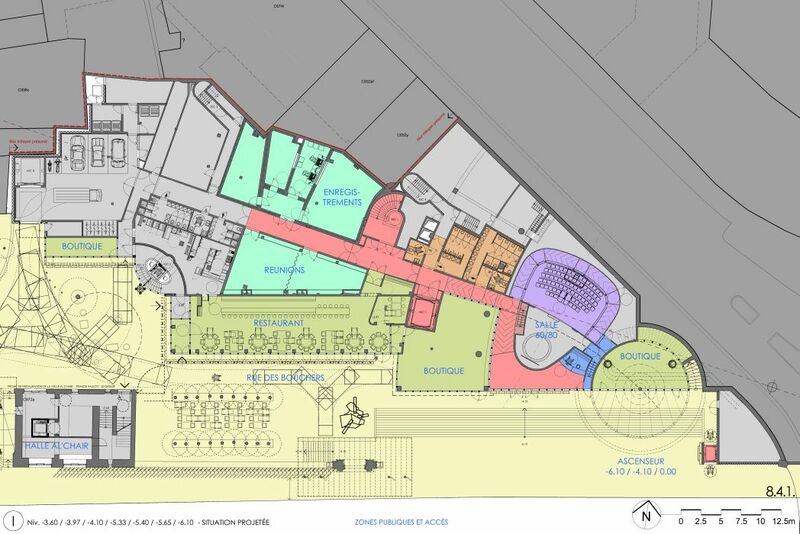 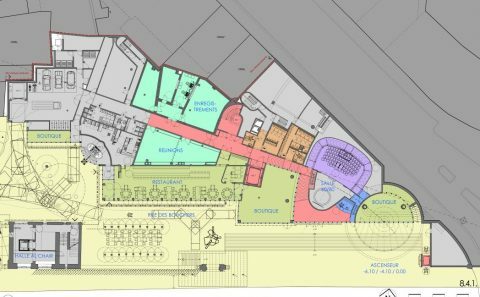 the entrance for VIPs, performers and personnel and the logistics and technical services zone (grey). the stage with its backstage area and dressing rooms (grey). 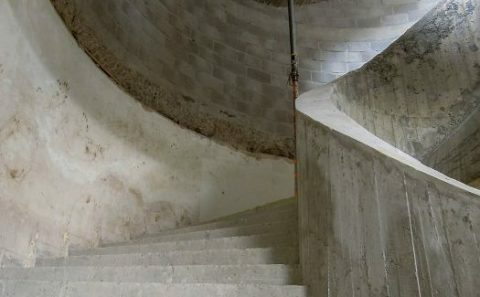 the caretaker’s room on the west side (grey). 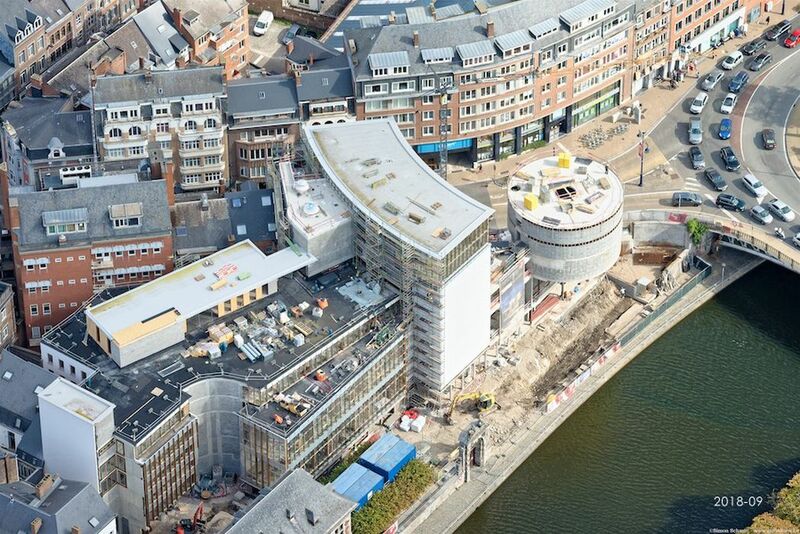 the main offices on the west side (grey). 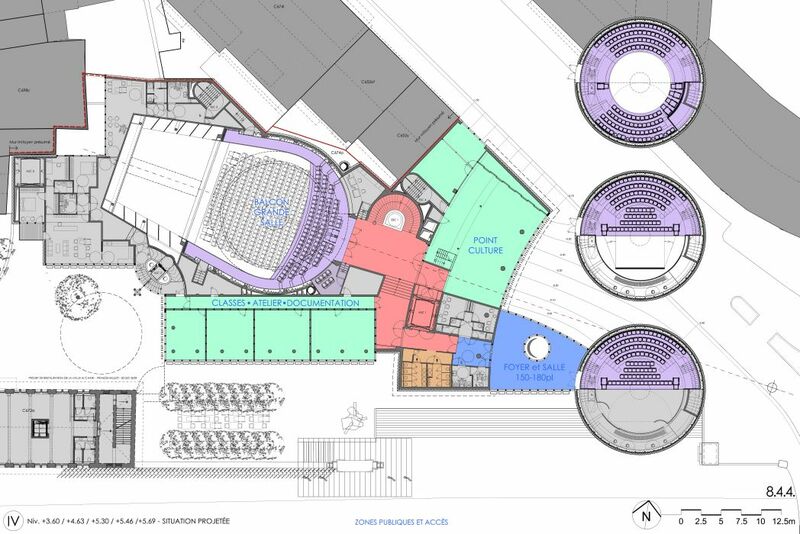 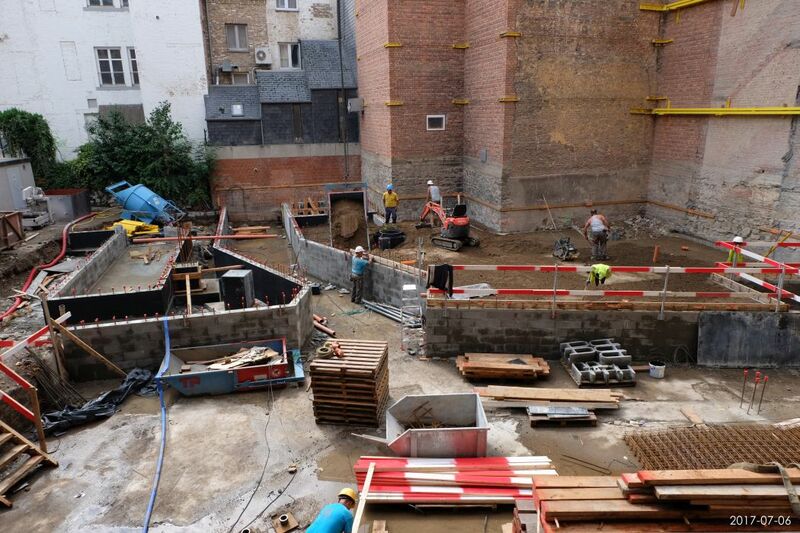 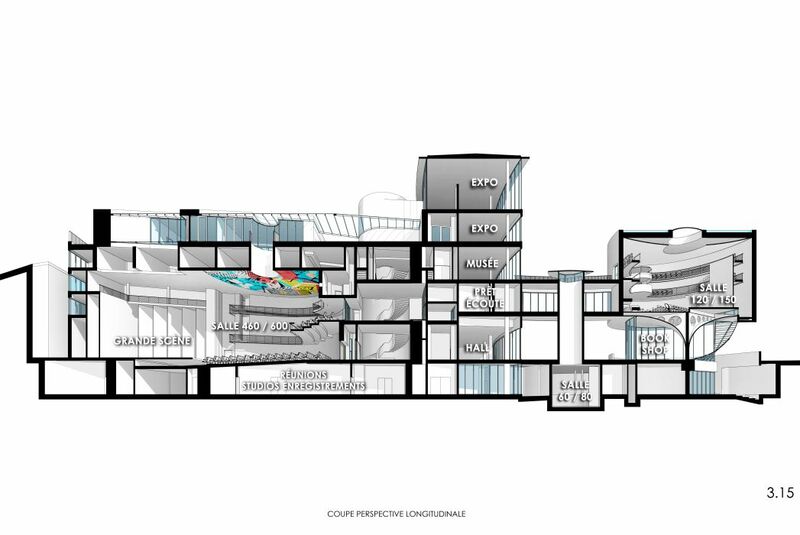 the artworks storage area on the main theatre and the suite of offices (grey). 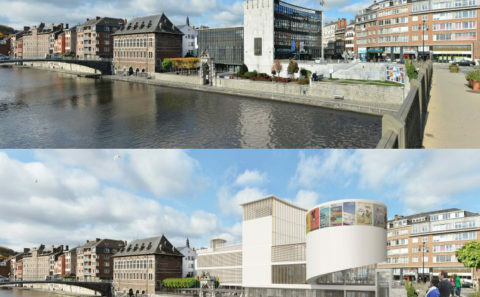 the artists’ studios (light green). 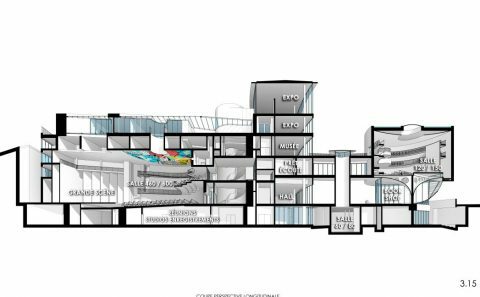 All the public areas can be accessed independently and directly from the existing main staircase and the new adjoining service lift. 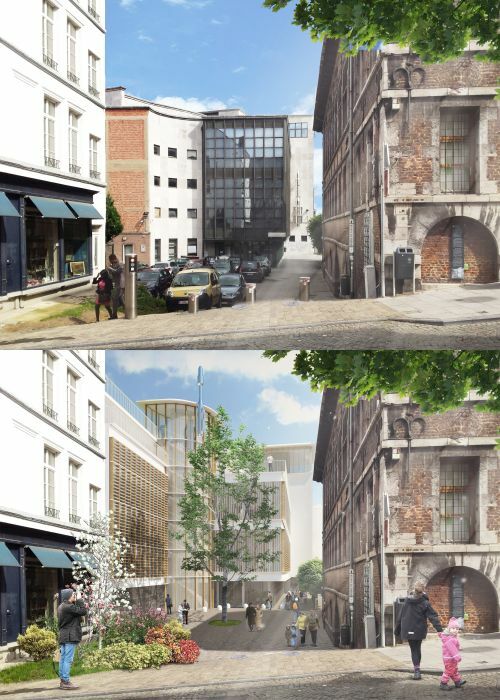 Sunlight lights up the building from the morning through to the evening and the prevailing south-westerly winds bring cool, fresh air from Citadelle Park. 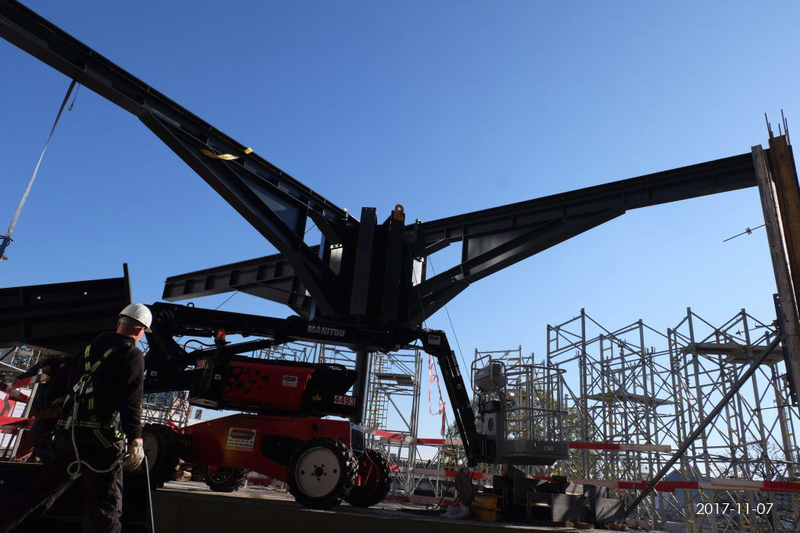 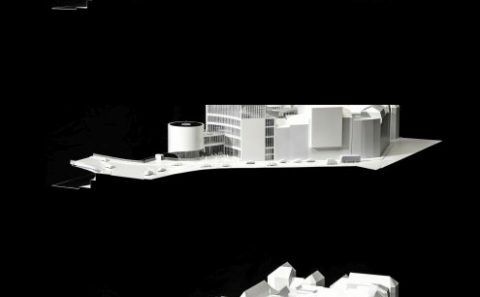 The shadow analysis reveals that the project will have minimal impacts on the site. 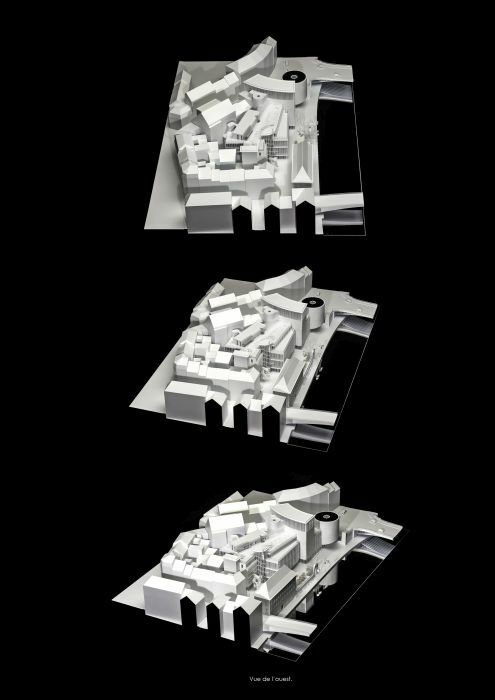 The clean lines of its facades derive optimal benefit both from the natural light and the natural ventilation, free from noise and dust. 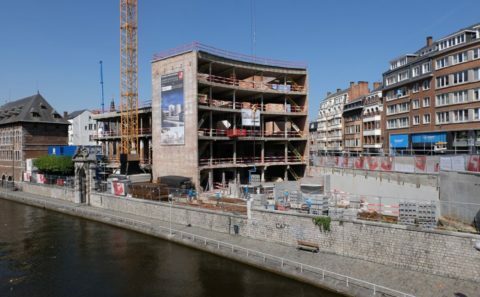 The building also forms a screen between the noise of avenue Golenvaux and the rue des Bouchers, which further enhances this sun-bathed riverside environment. 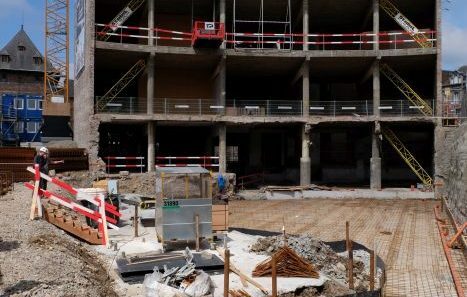 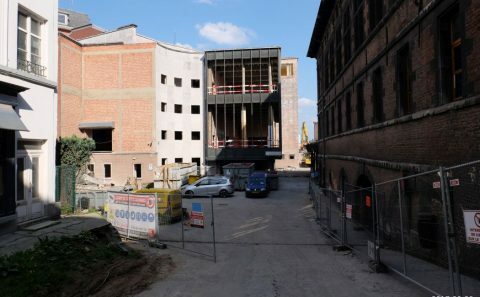 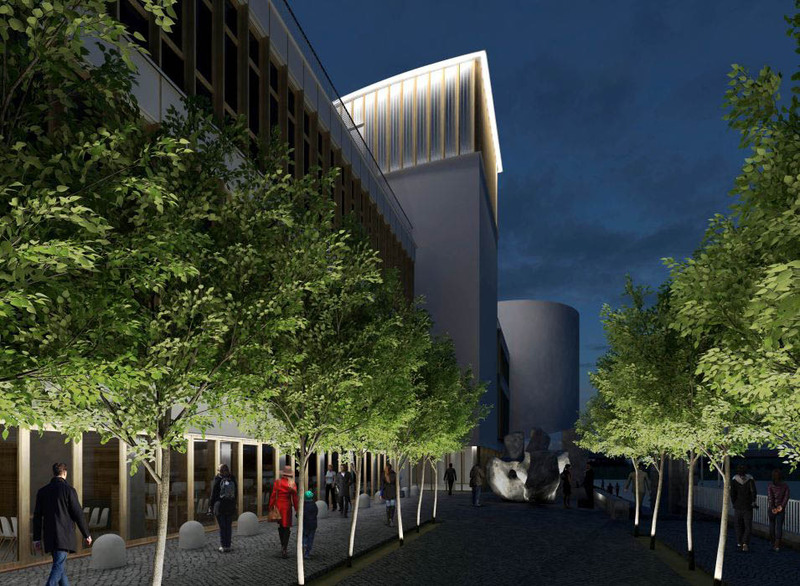 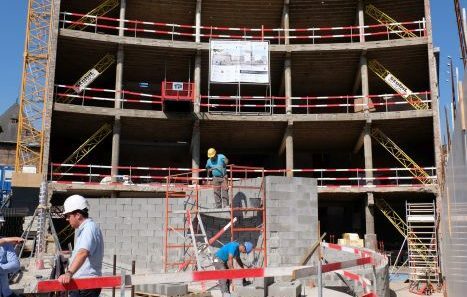 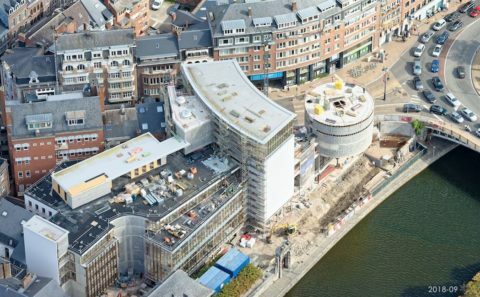 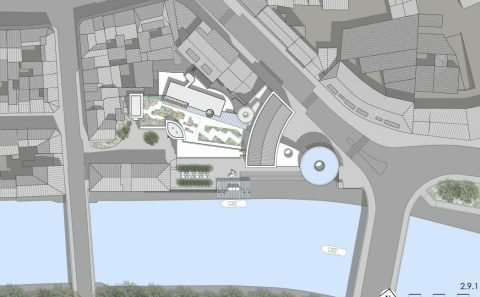 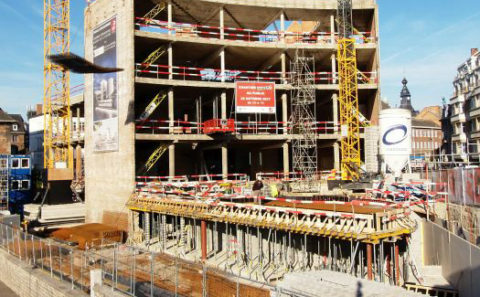 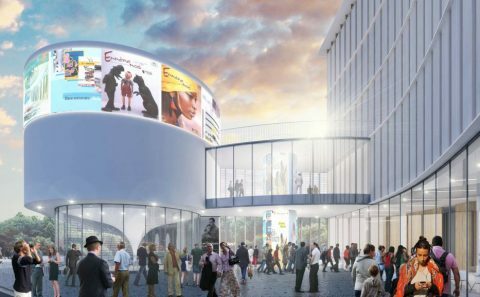 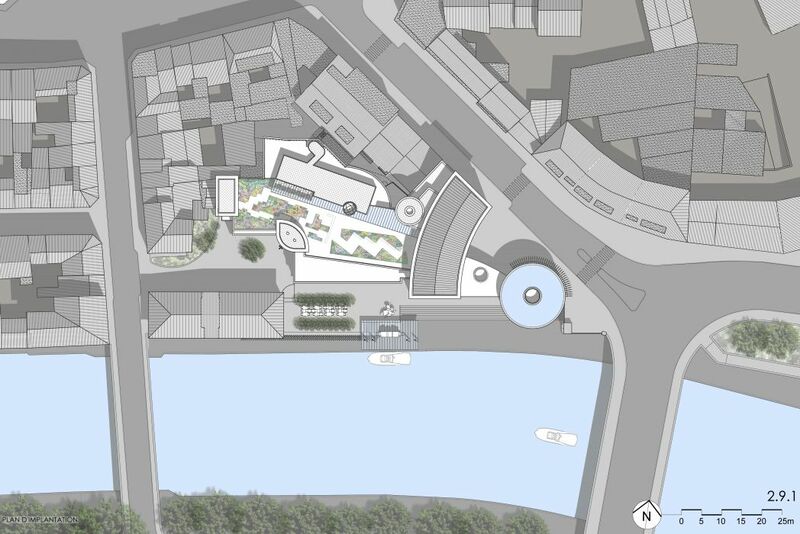 The focus of the redevelopment of the areas surrounding the building is on optimising the flows of pedestrians, persons with reduced mobility, cyclists and the deliveries of goods. 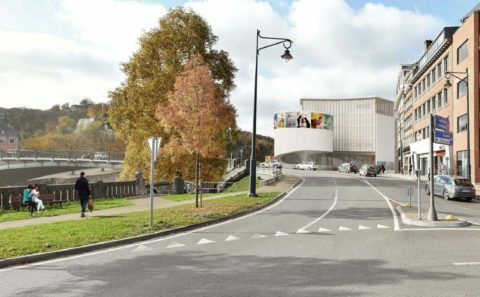 the pedestrian connections to Le Grognon via the France and Musée bridges. 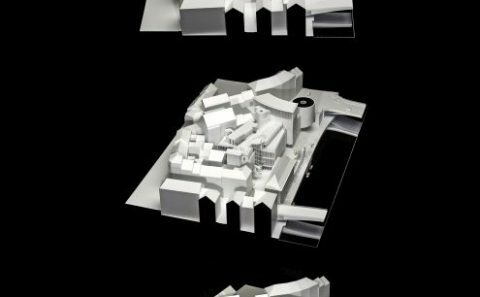 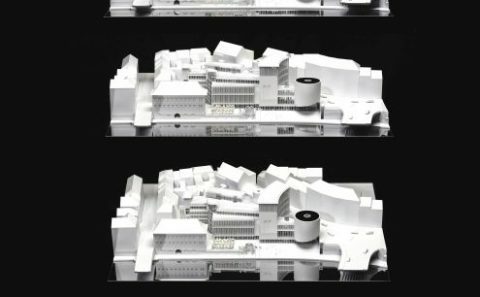 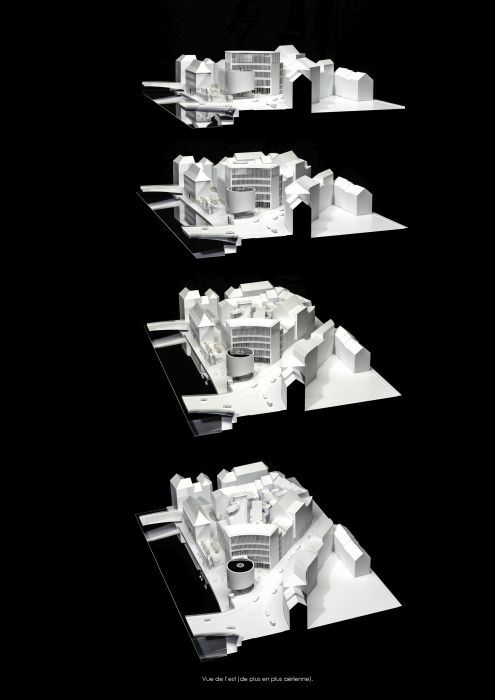 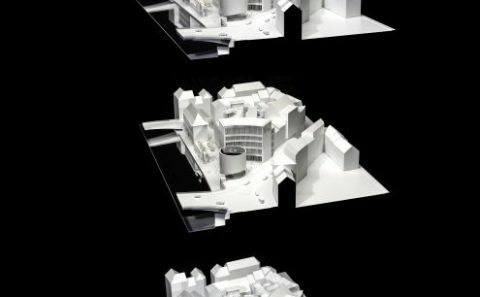 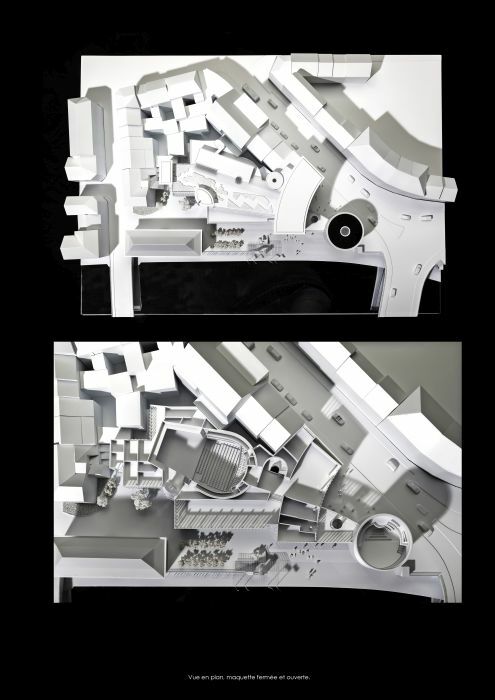 The project thus directs the appeal of the building’s south-facing facade to the rue des Bouchers, starting from the discrete access door for heavy goods deliveries at the courtyard at the most westerly point. 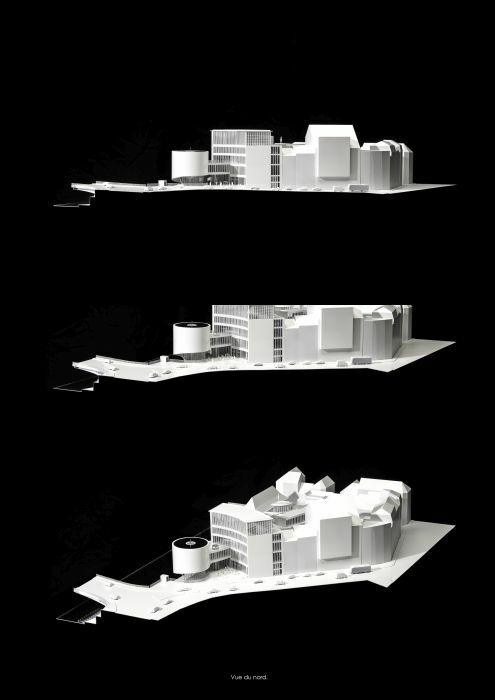 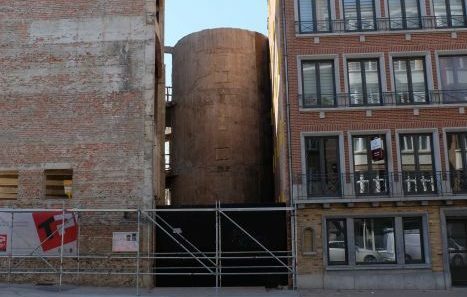 On avenue Golenvaux, the new cylindrical space sitting on a foot creates the “prow” of the building and produces a focus for the building and for traffic and pedestrian flows around it. 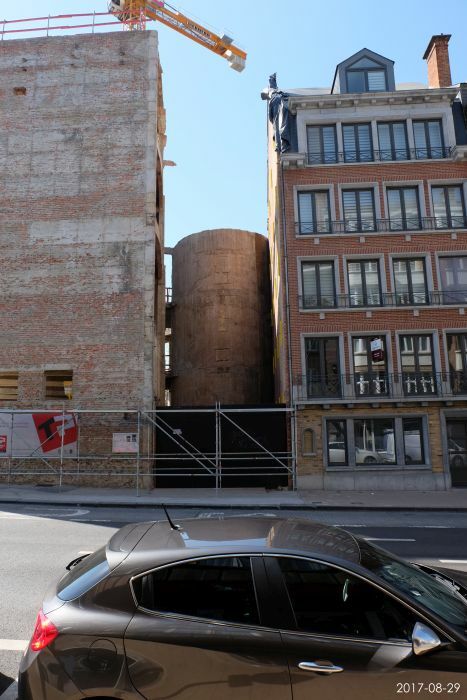 When viewed from Boulevard Brunell, the cylinder sets off the curve of the Victor Bourgeois building which, with its raised elevation, now has a certain majesty. 2) to be confident regarding the comfort of the climatic conditions in areas around the entrances to the building and on the rue des Bouchers. 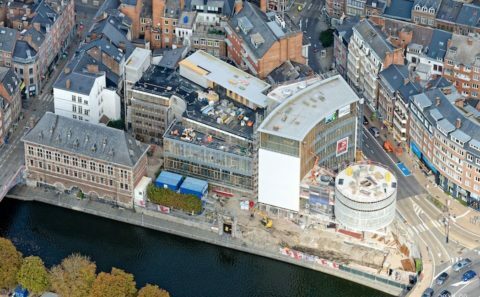 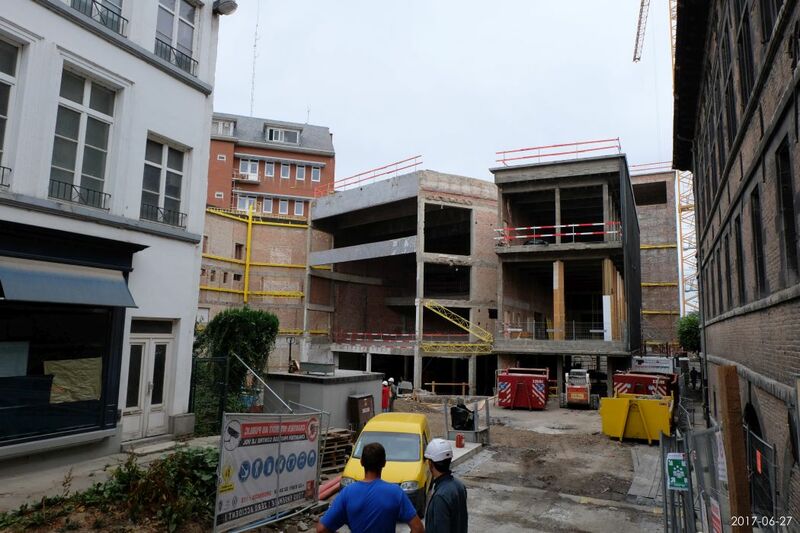 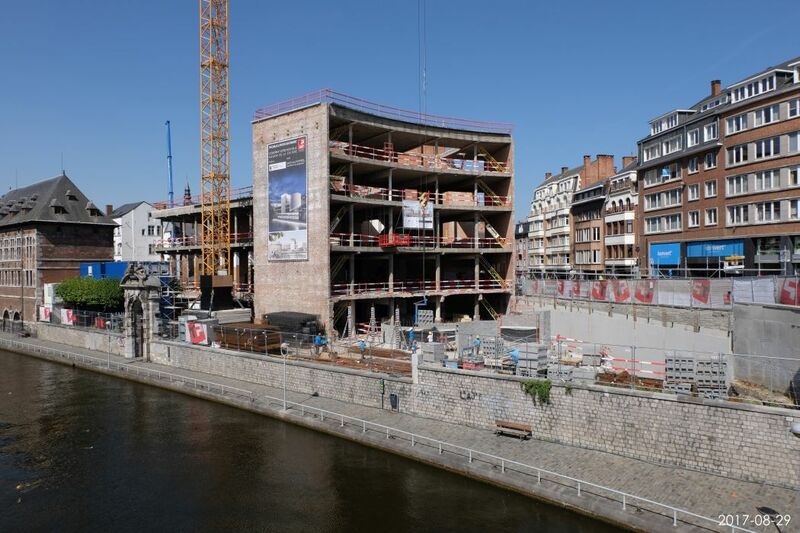 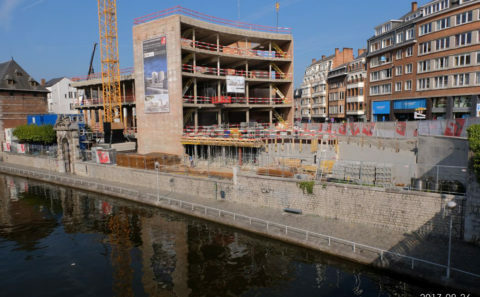 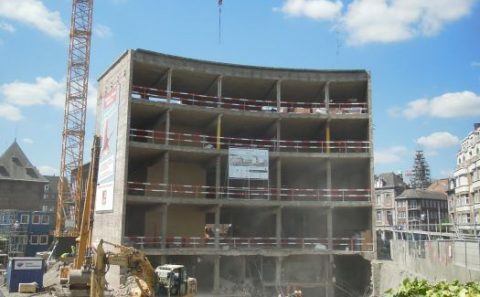 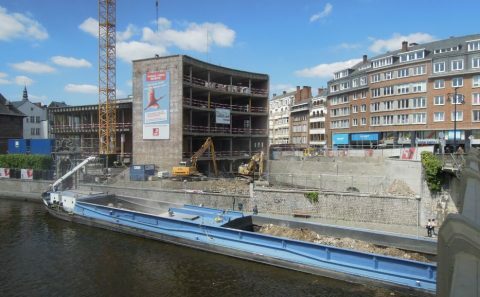 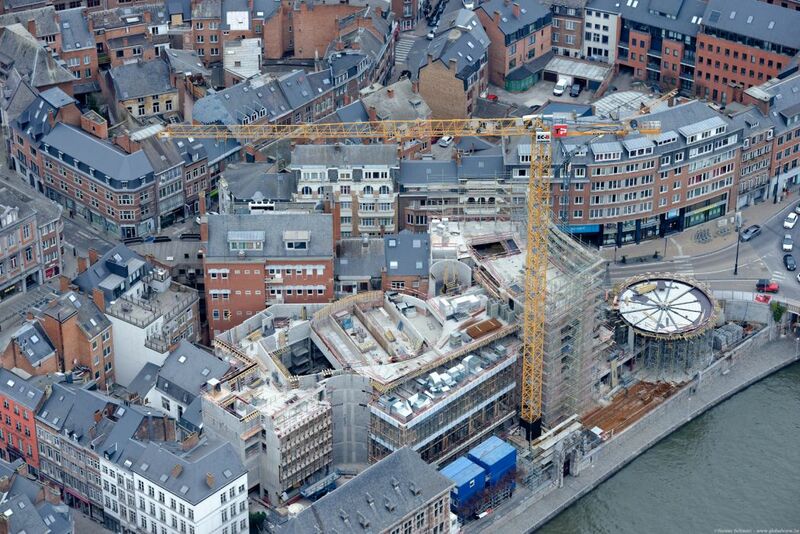 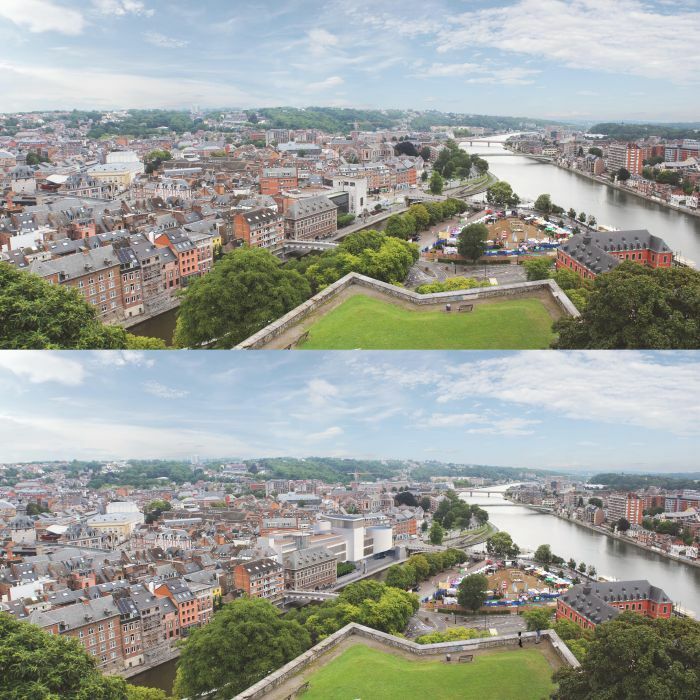 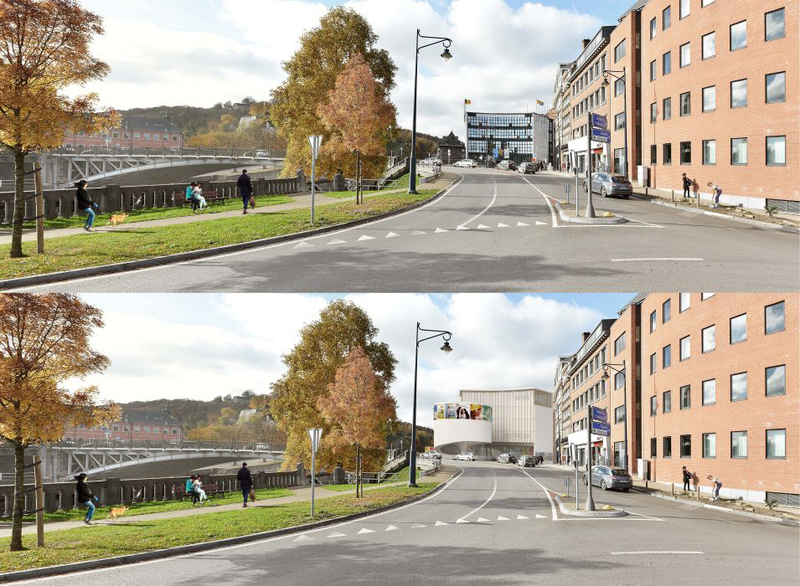 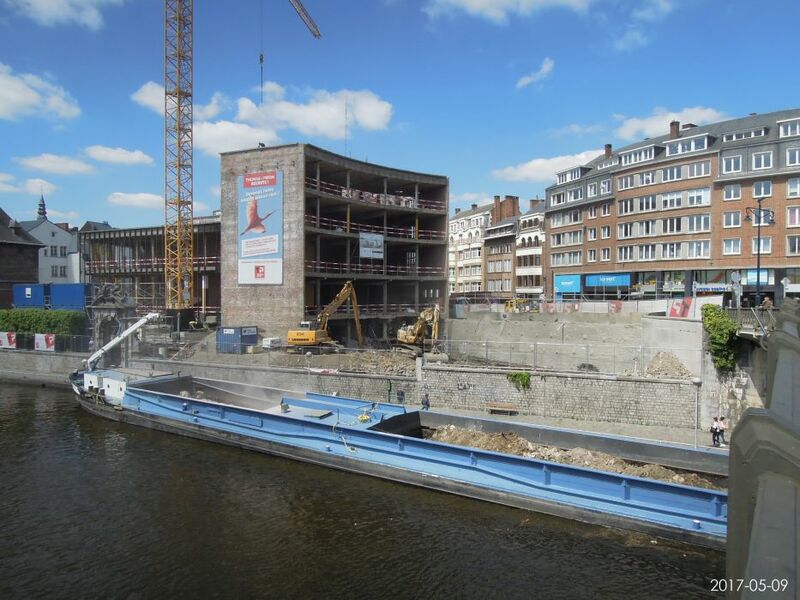 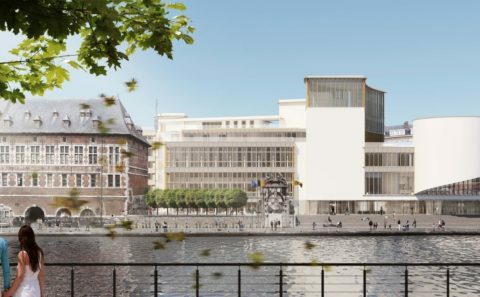 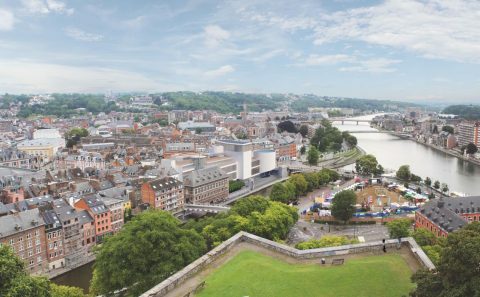 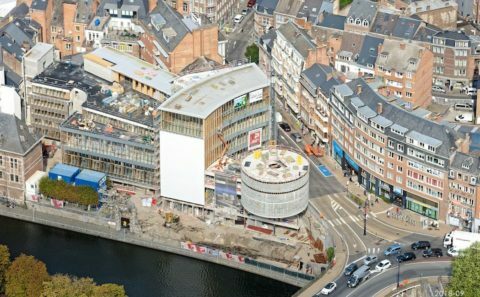 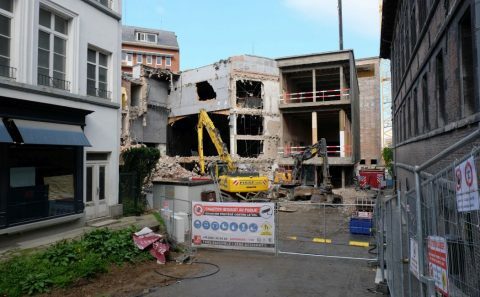 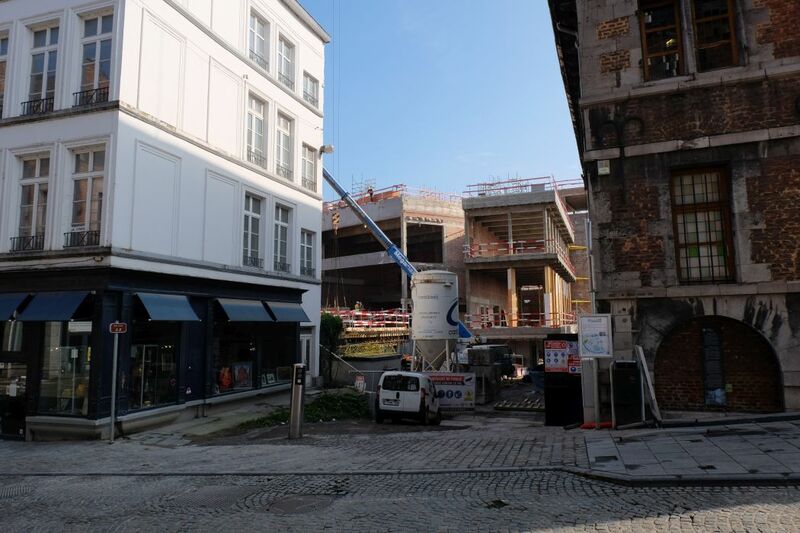 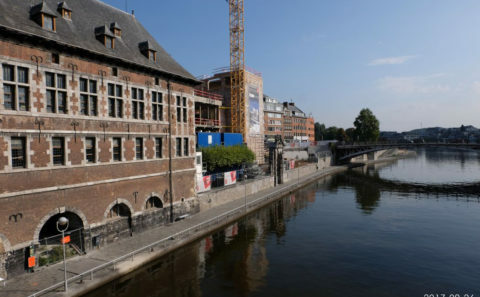 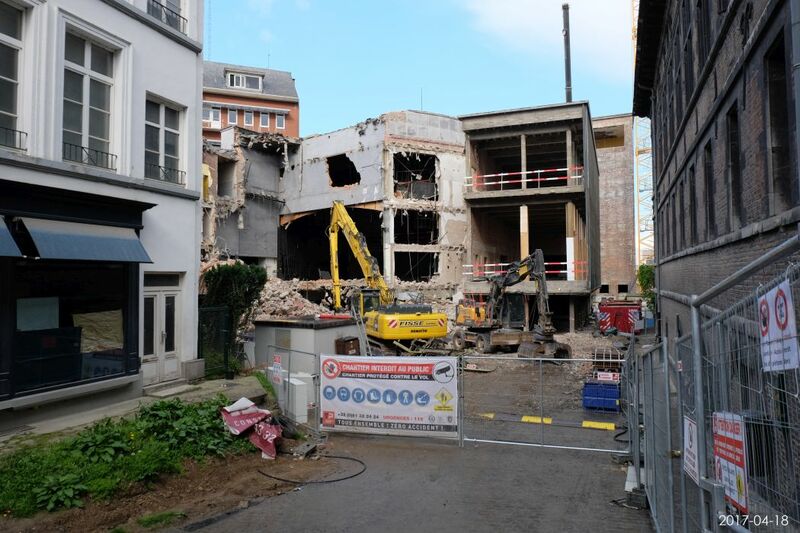 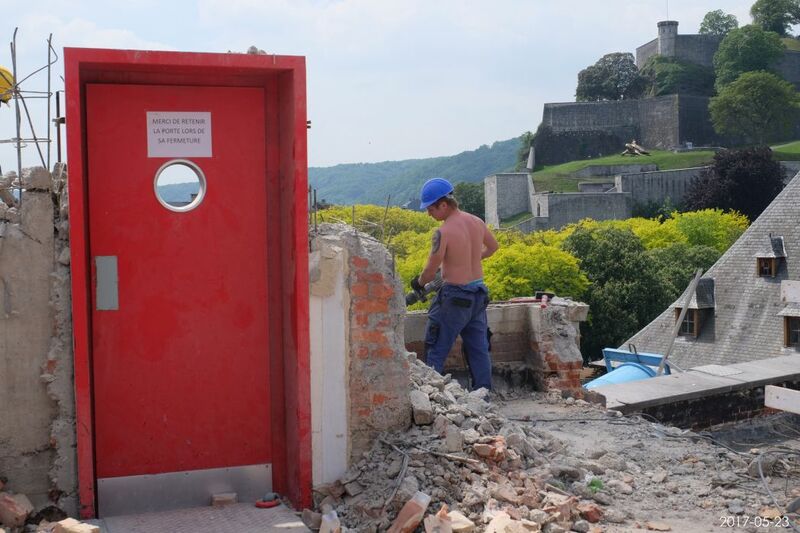 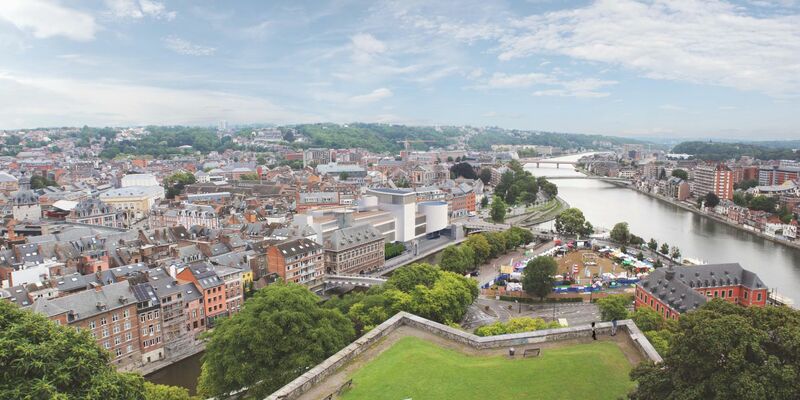 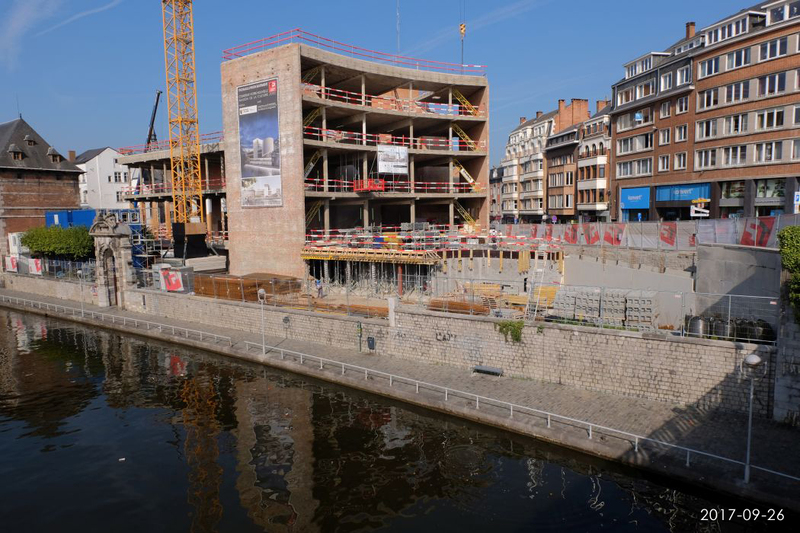 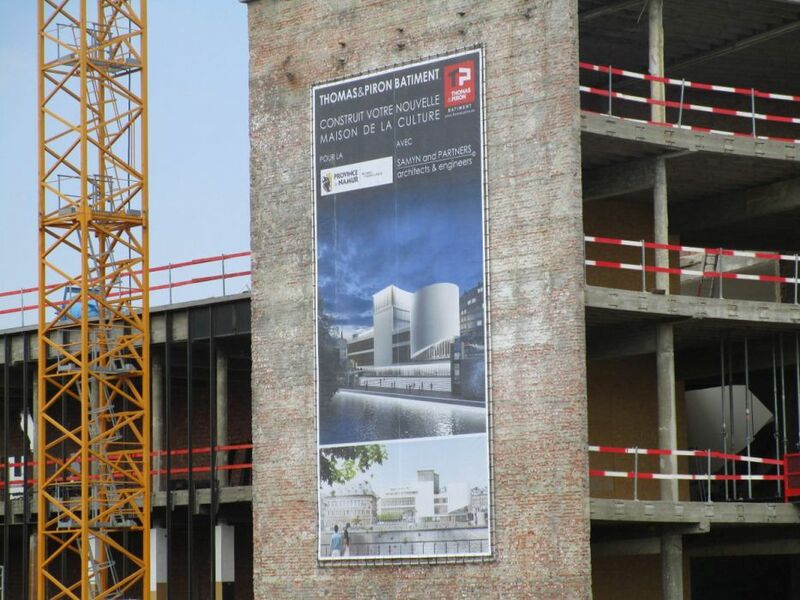 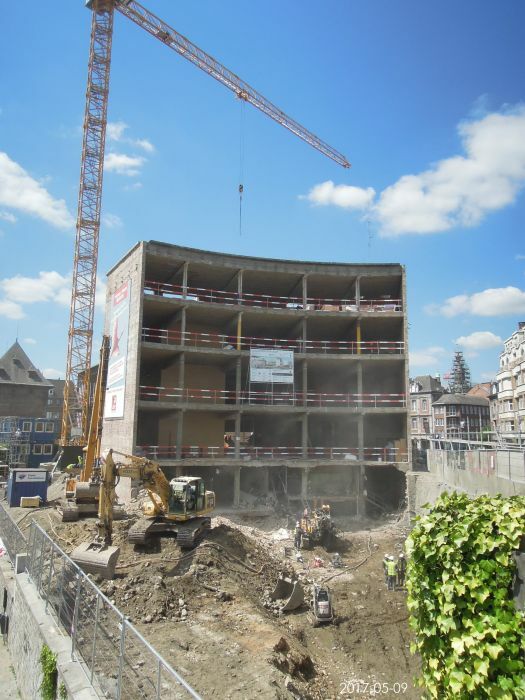 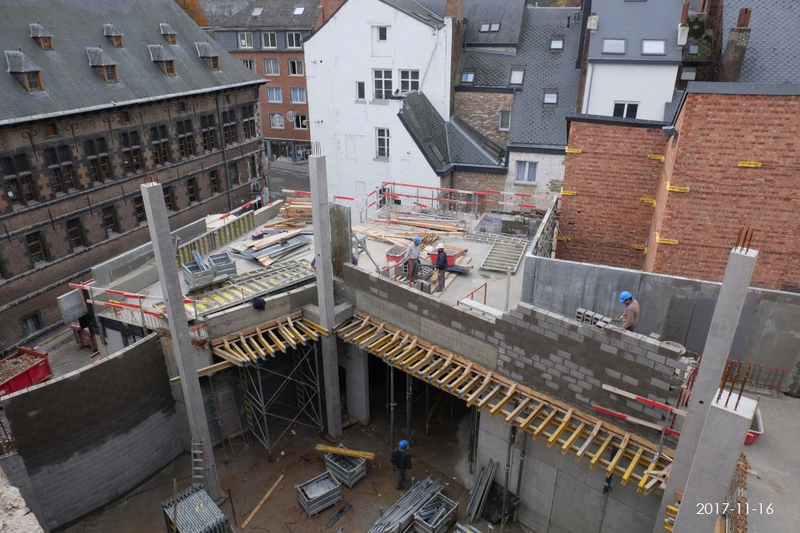 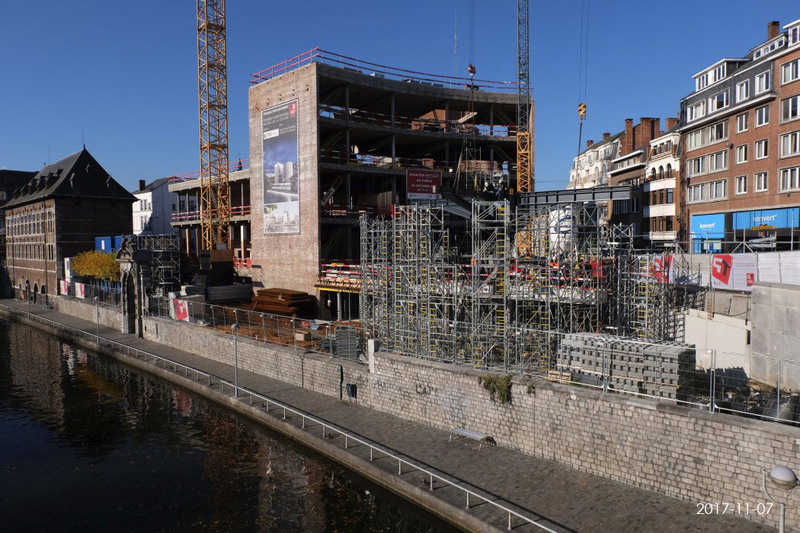 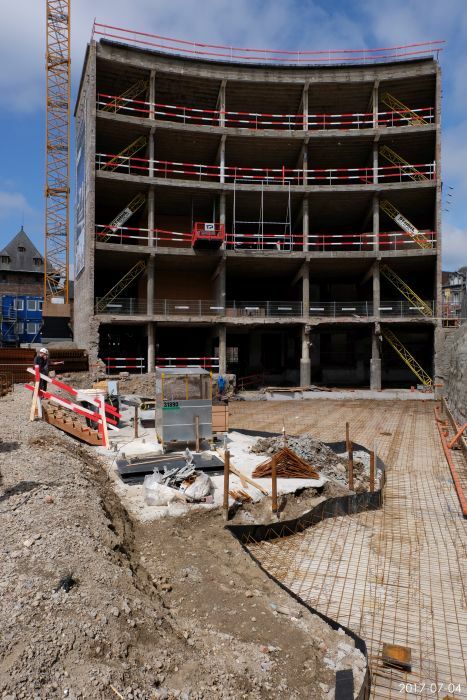 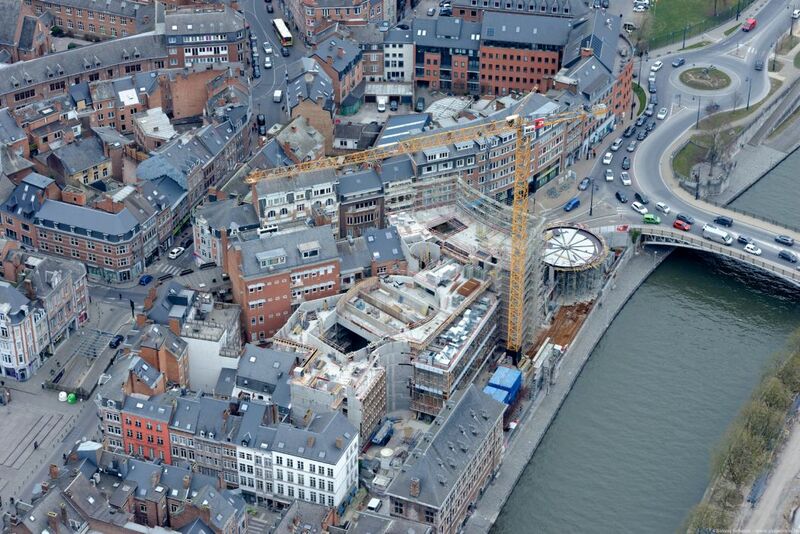 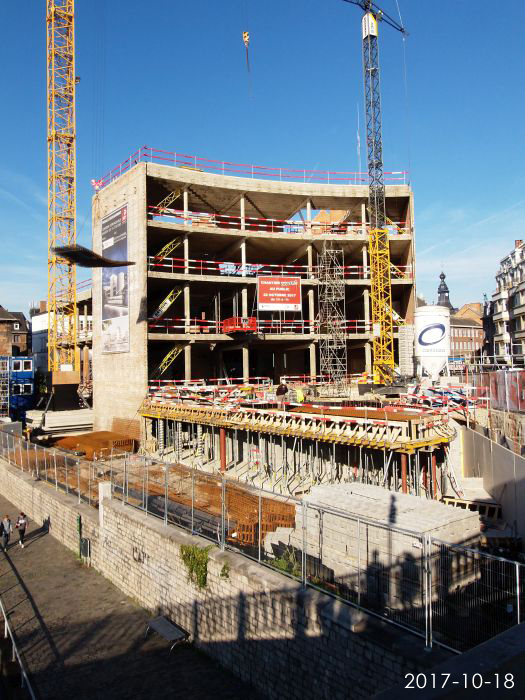 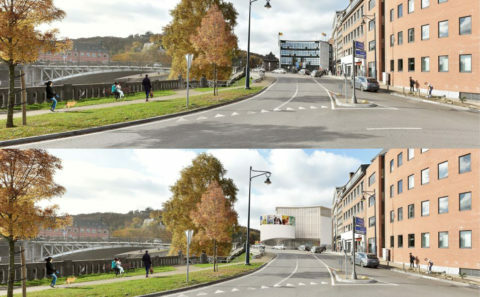 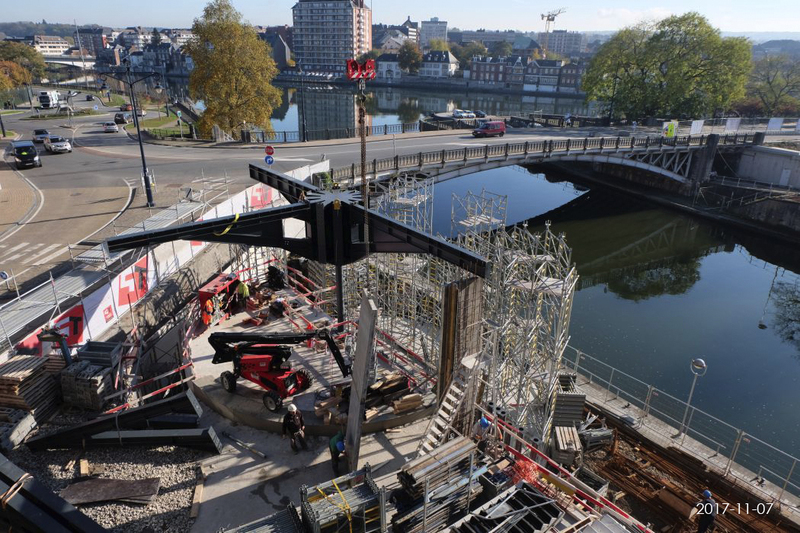 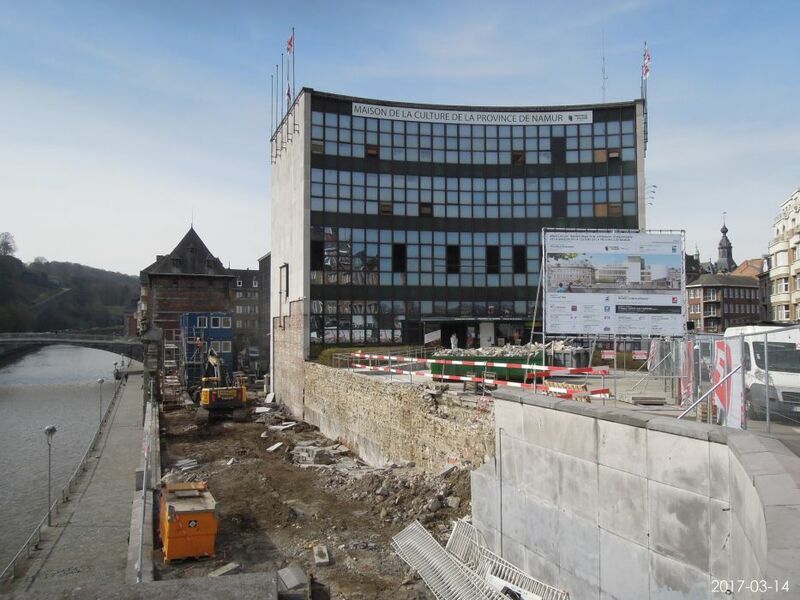 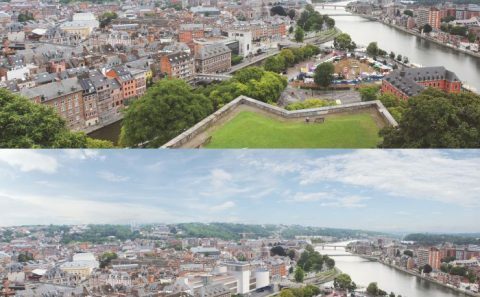 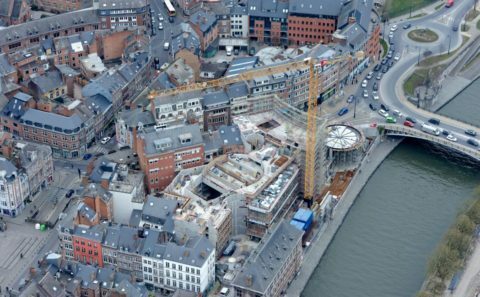 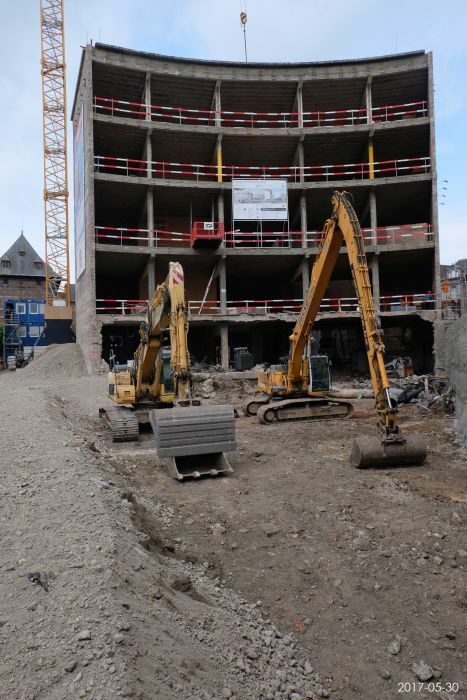 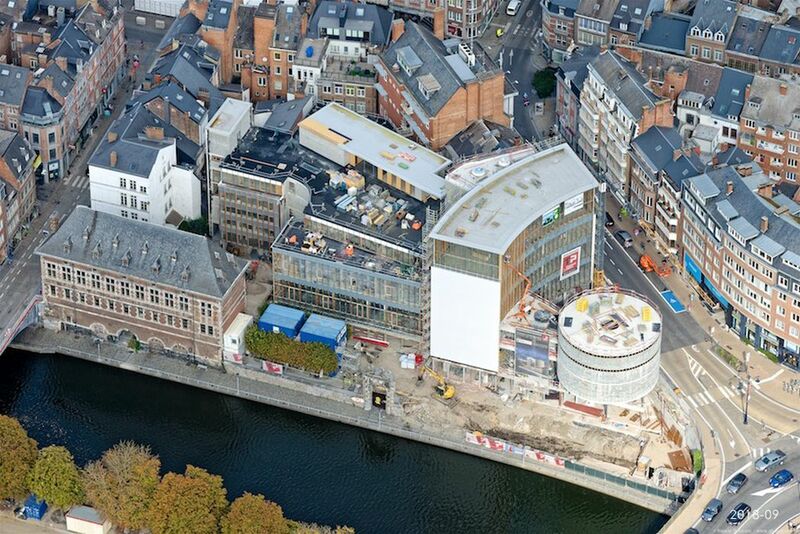 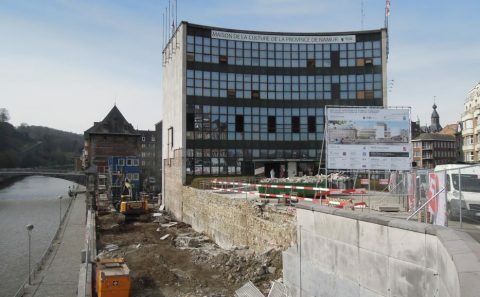 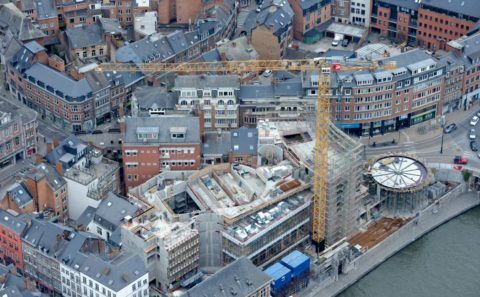 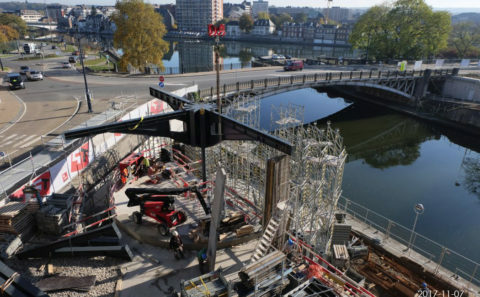 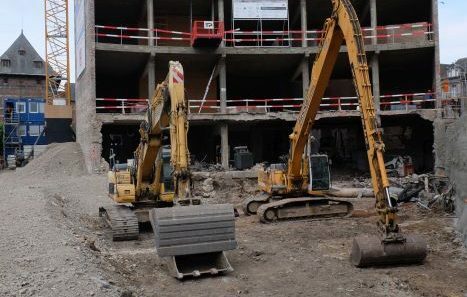 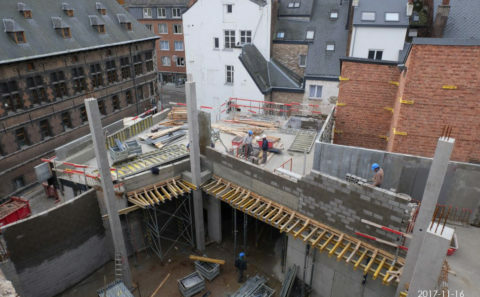 The centre of Namur, which is well ventilated due to its topography and rivers, is fortunate in that it does not suffer from these disadvantages. 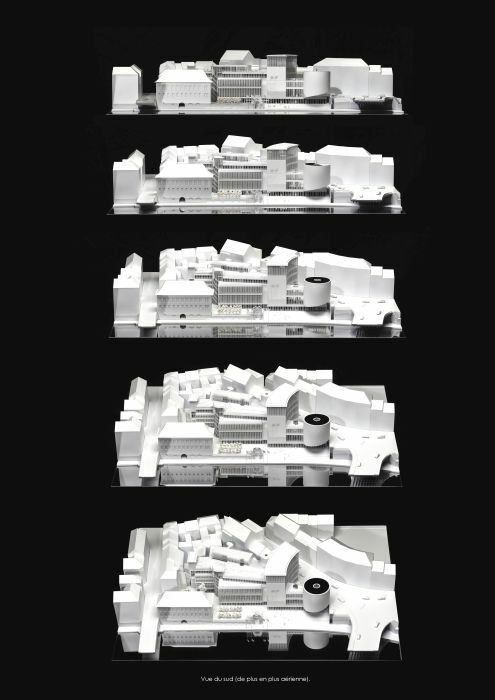 It is thus possible to return to more sensible practices, and to open up the building to its environment. 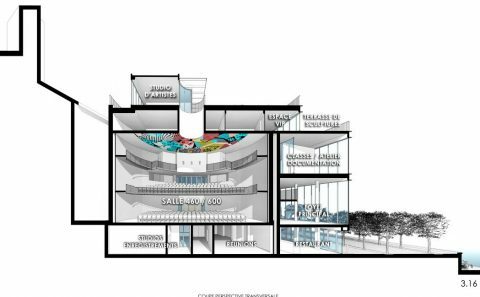 Since they are sheltered from sources of noise, the rooflights necessary for both ventilation and natural daylight, suitably protected from the rain, can thus be used for natural ventilation, along with opening windows. 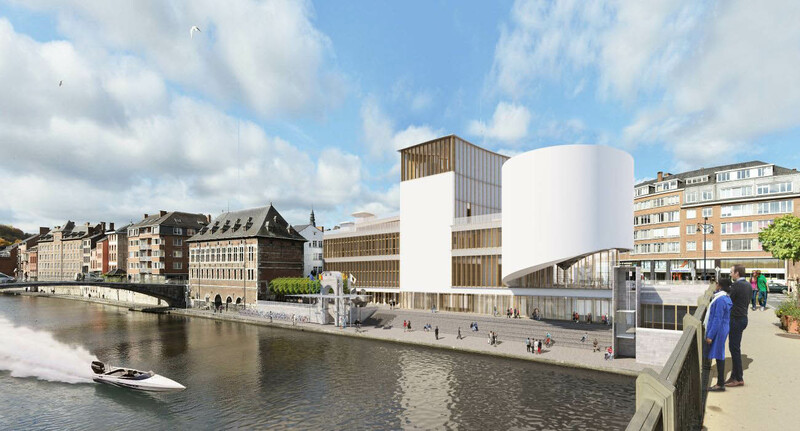 Louvres, fitted vertically on east and west facades, and horizontally on south-facing facades, will be used to adjust the degree of natural illumination through the facades, and to provide shading. 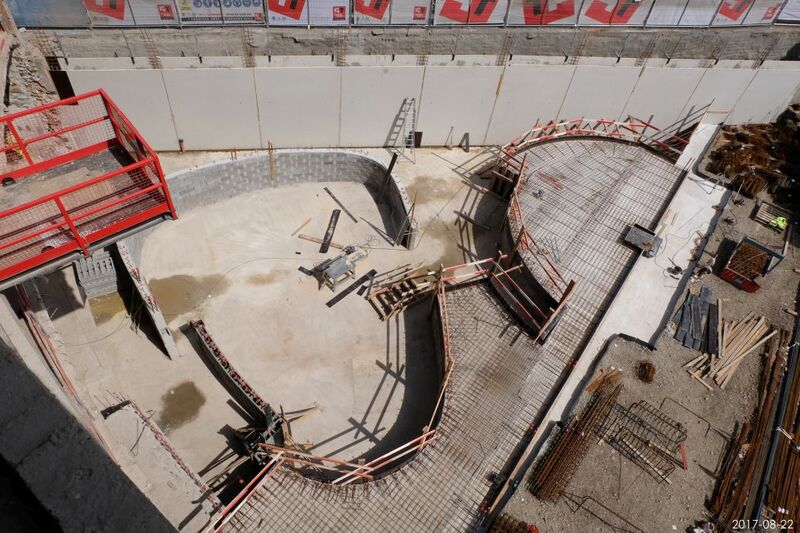 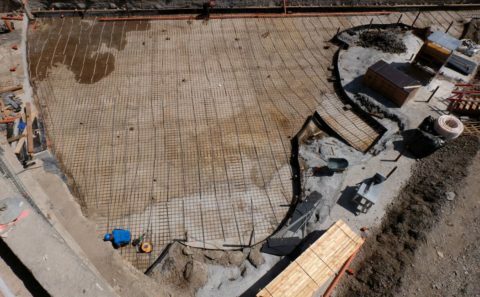 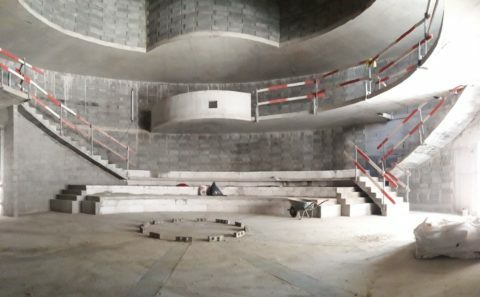 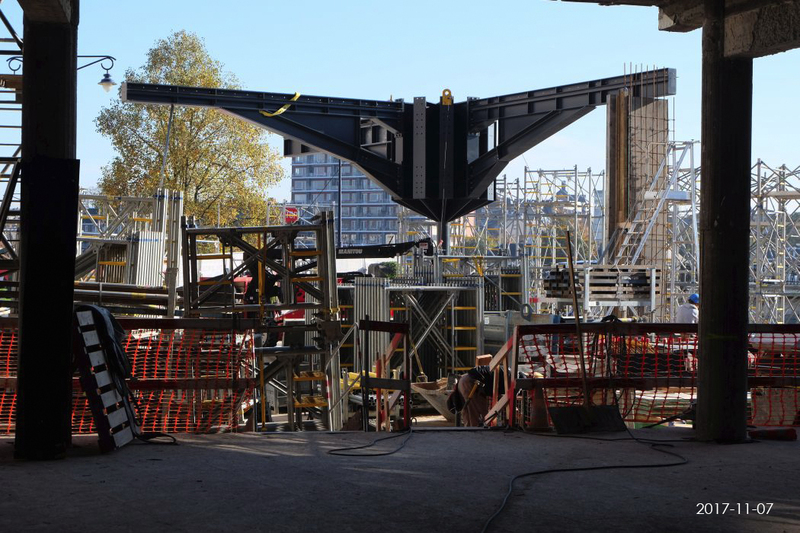 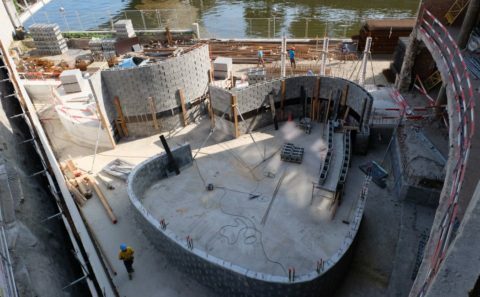 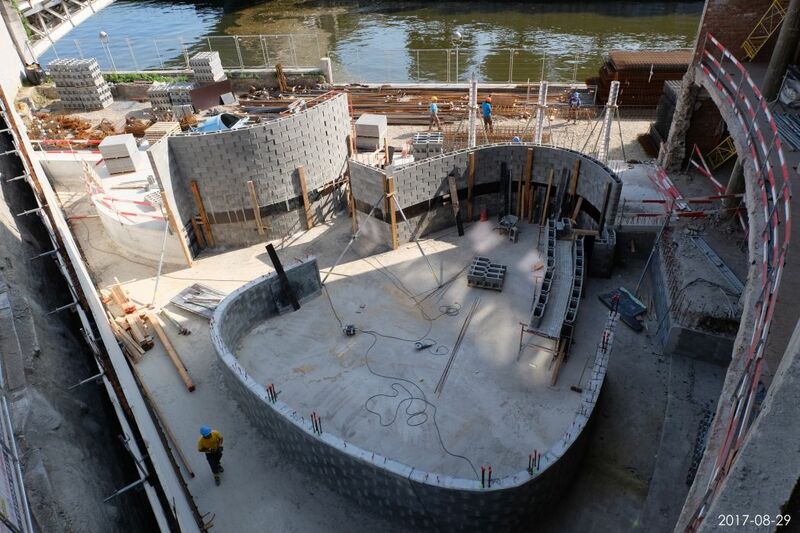 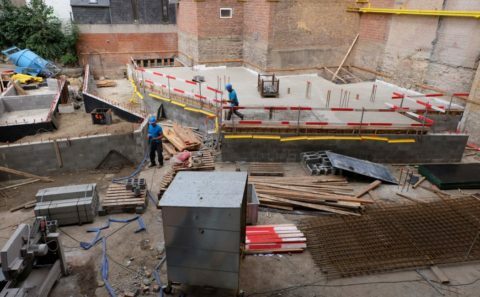 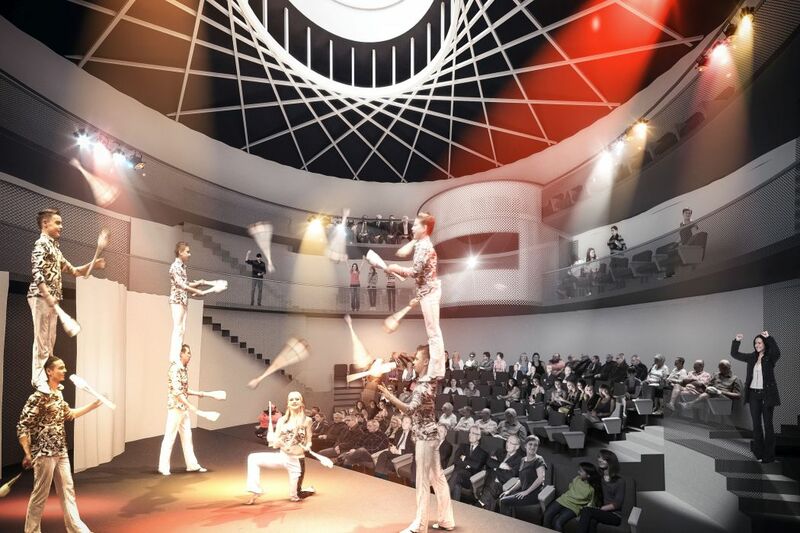 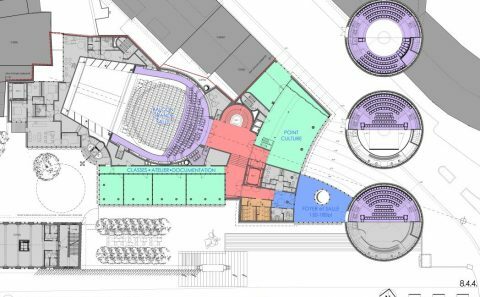 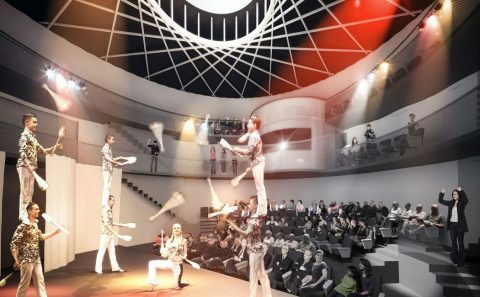 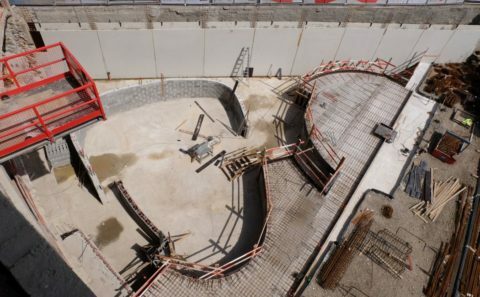 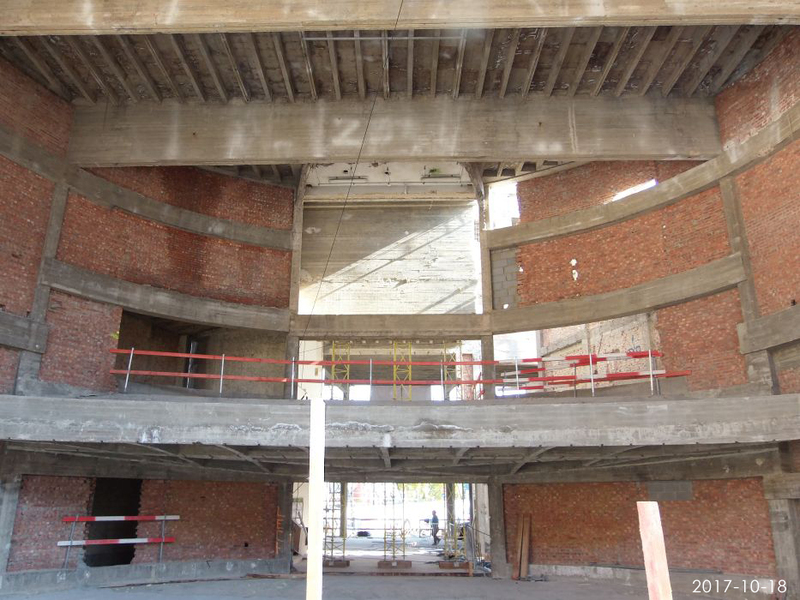 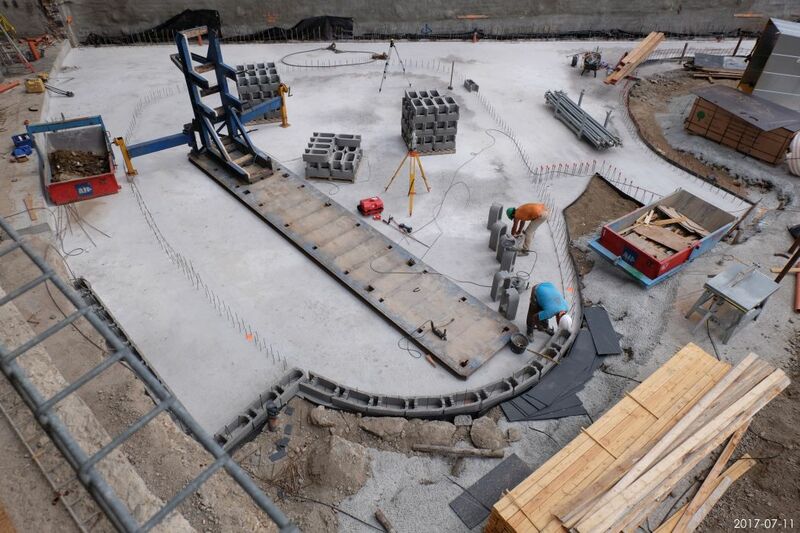 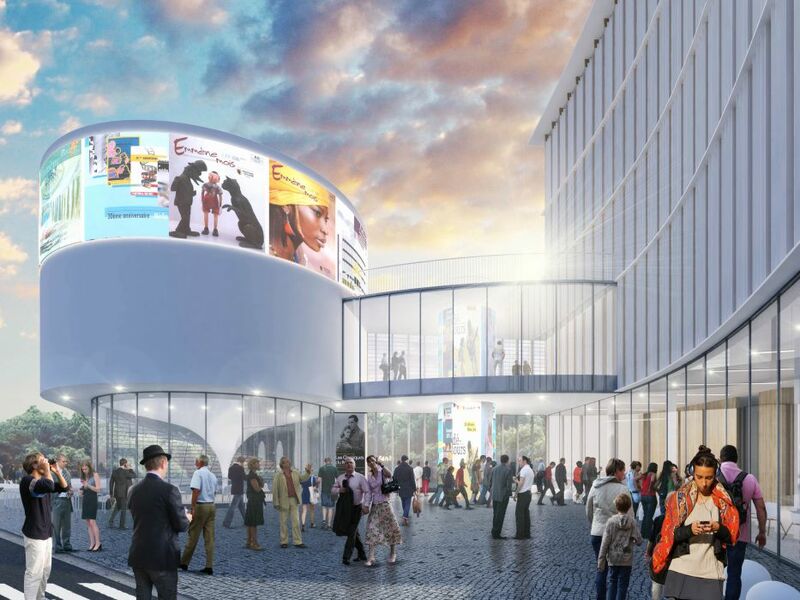 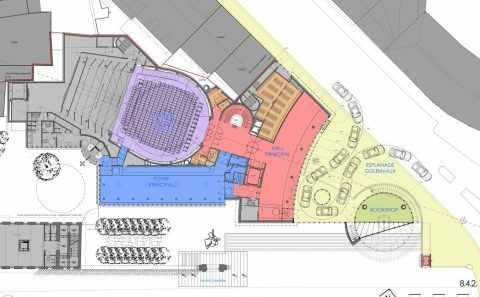 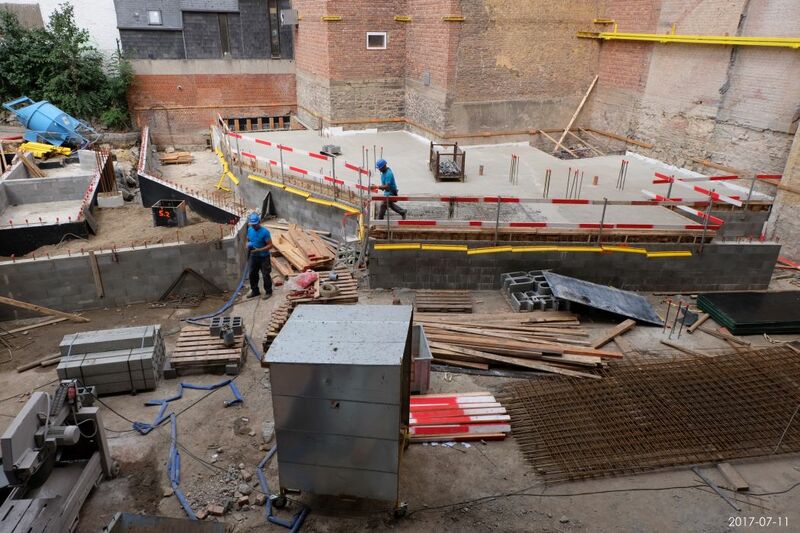 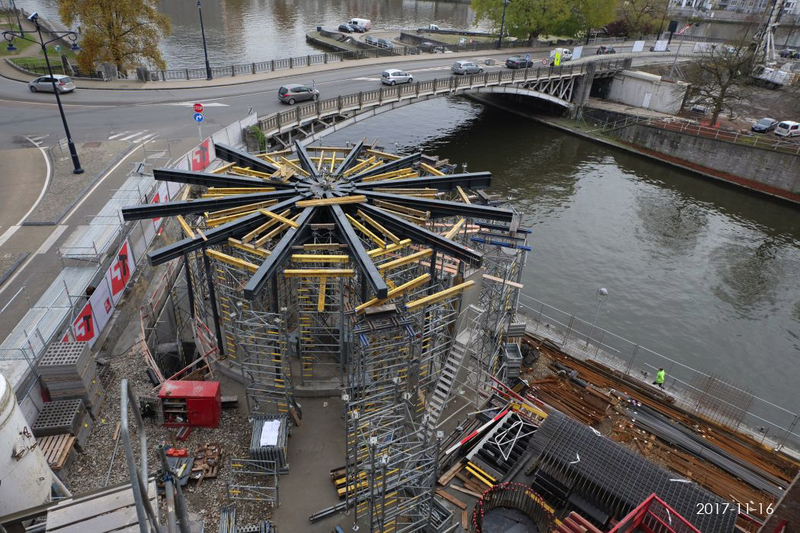 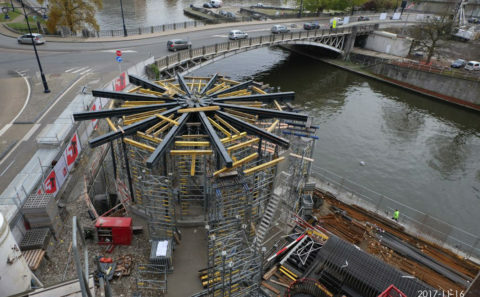 Light wells shall provide natural illumination for the stages and stall seating in the three theatres. 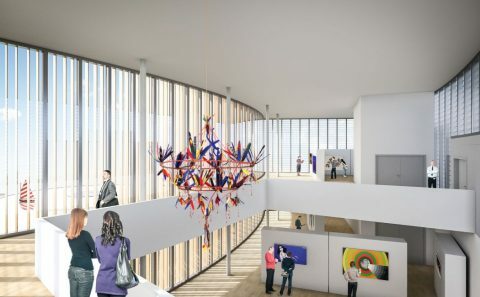 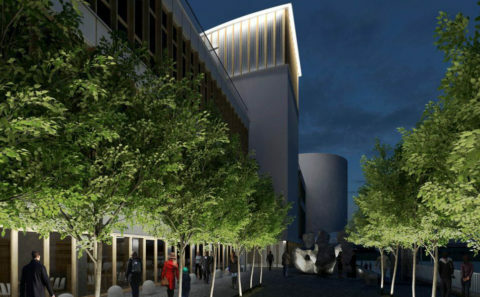 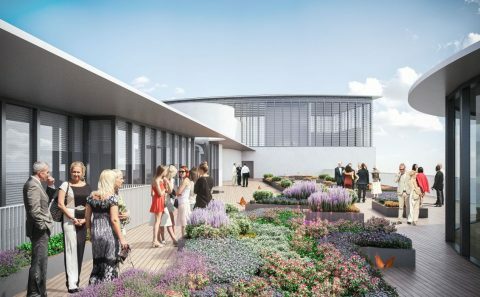 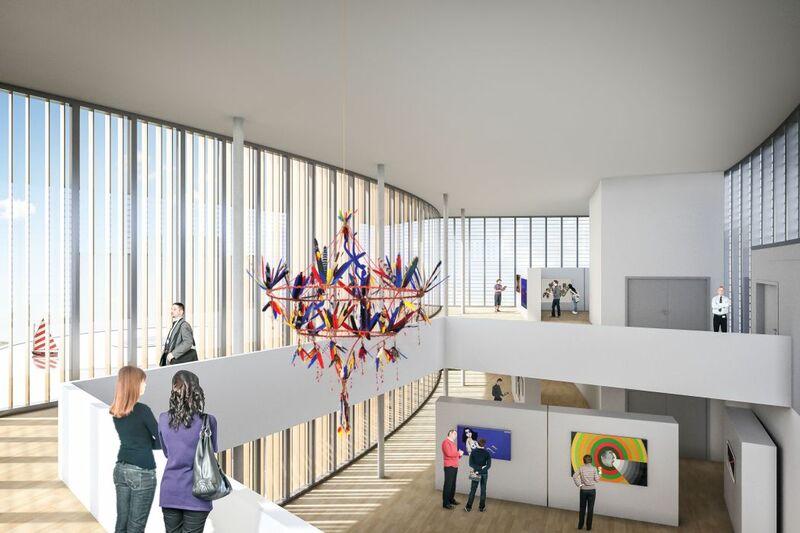 Some of the key considerations in this study have been: respect for the cultural heritage, the integration of existing artworks, fire safety, problem-free disabled access (Access-i certification), and respect for the environment (“Excellent” Breeam rating). 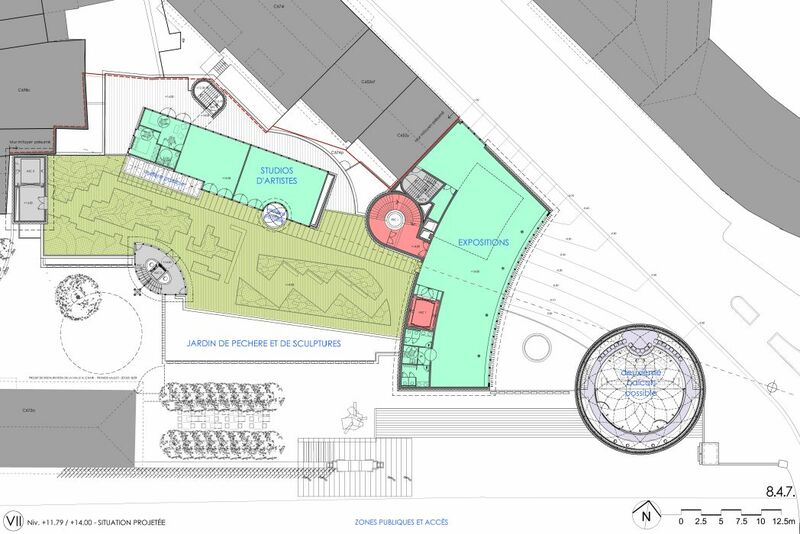 “Design & Build” consultation conducted on behalf of “Cœur de Ville” (Entreprise Thomas et Piron). 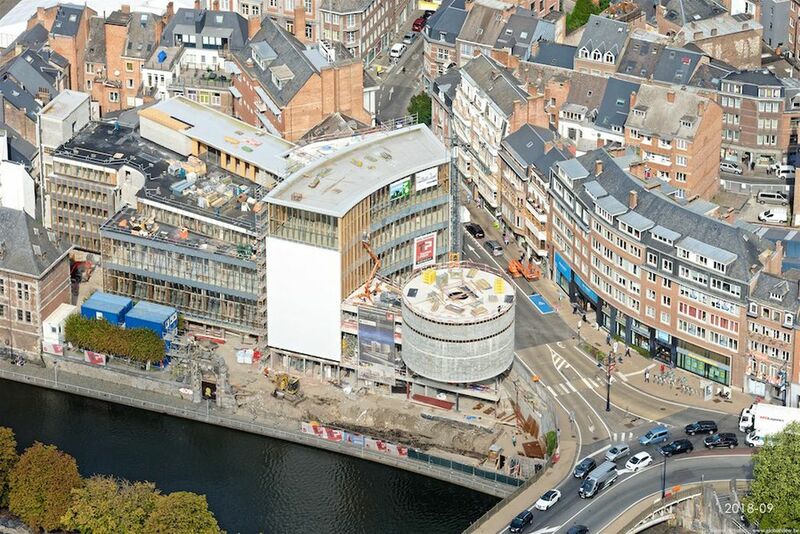 Place Saint-Aubain,2, 5000 Namur, Belgique. 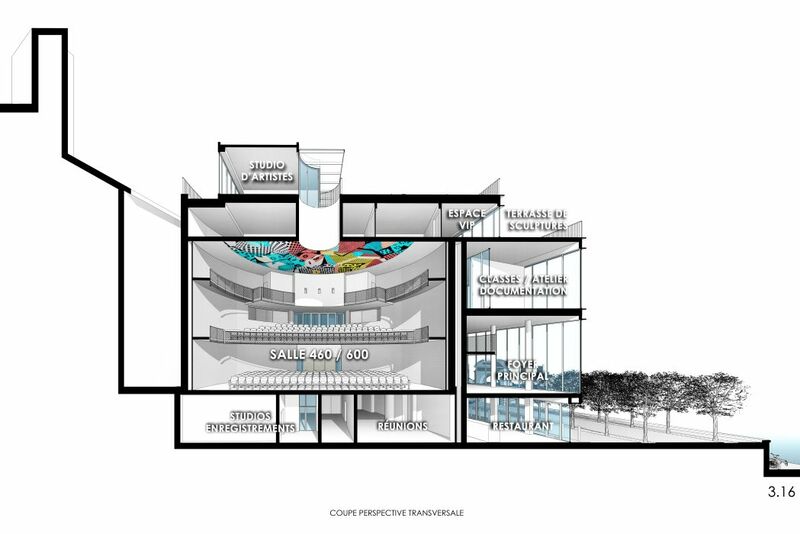 Design Partner : Dr Ir Philippe Samyn. Administrative Partner : Ghislain André. 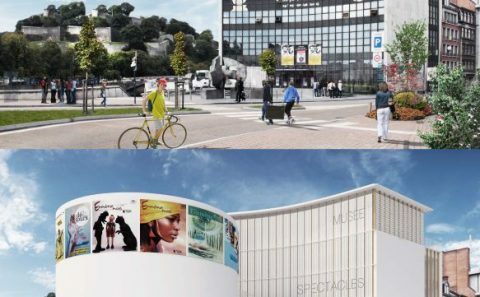 Associés consultants : Mehdi Chtourou, Åsa Decorte, Benoit Lacassagne, Denis Mélotte. 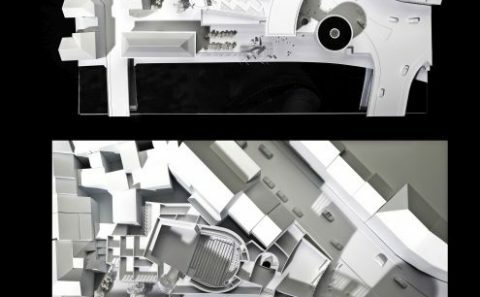 Collaborateurs : Karim Ammor, Gian Luca Barbieri, Justine Bonhomme, Giuseppe Cardillo, Alejandro Chichizola, Silvia Figoli, Daniele Galuppi, David Guillemaud, Roser Igual, Giulia Lorini, Quentin Olbrechts, Vlad Popa, Alexio Rava, Gunhi-boar Silva Baticam, Radu Somfelean. 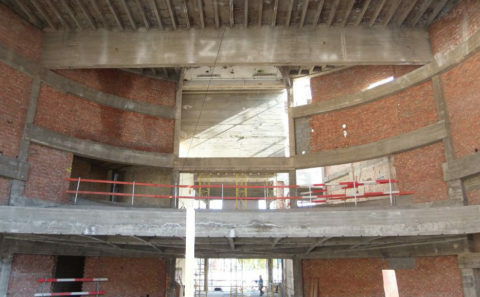 SIX Consulting & Engineering s.a. / DTS & CO s.a.